Welcome to any new visitors and Thank You to any returning visitors for popping over once again to have a look at my blog. And also thank you to everybody who’s left comments on my previous blog posts. I really do appreciate them all. I’ve not finished crafting a lot of items the last few days, though I’ve got a lot of bits prepared, coloured, cut out, etc., therefore I don’t have anything new to show you this time. 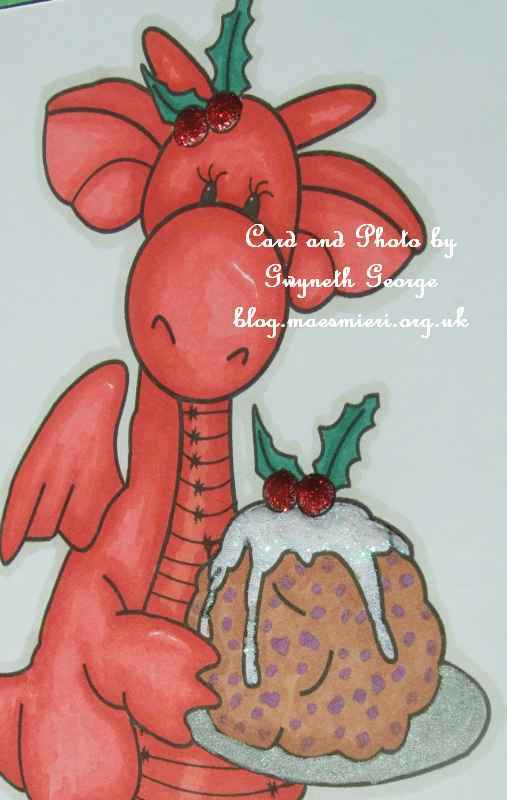 But, when I went to look at previous posts showing cards I’d done for card swops (because I wanted to check what I’d done before for consistency when I went to write a post about my November Stamping Dragon Designs FB Group card swop) I realised that several were still in draft with me. I must have completely forgotten to put them live when I was told that they’d arrived with the recipient (or perhaps I was ill at the time or never got confirmation that they’d arrived – I can’t remember now). In any case – I thought I’d better put the ones I’d missed blogging about into one post and show them to you today. I hope you like them. A closeup showing the easel dimension. A closeup of the coloured in image. 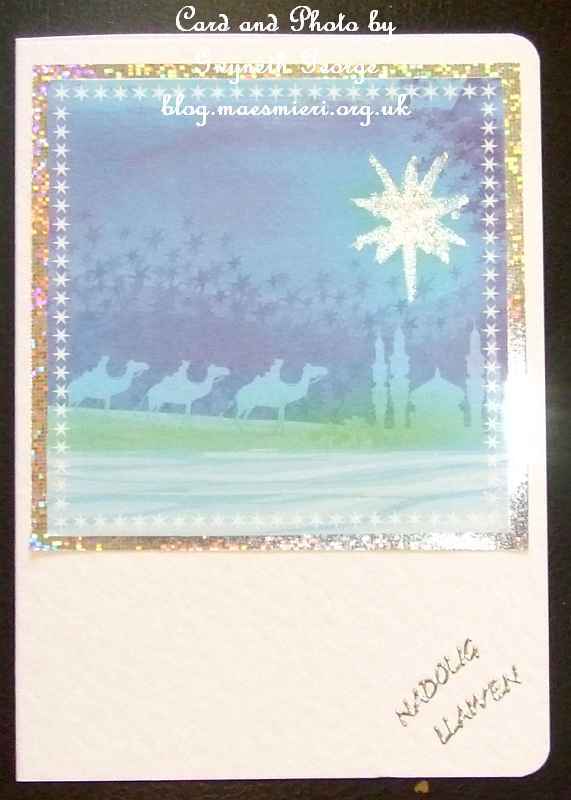 My partner for the September Card Swap was Carolyn. The theme for the September Card Swap was “AUTUMN”. 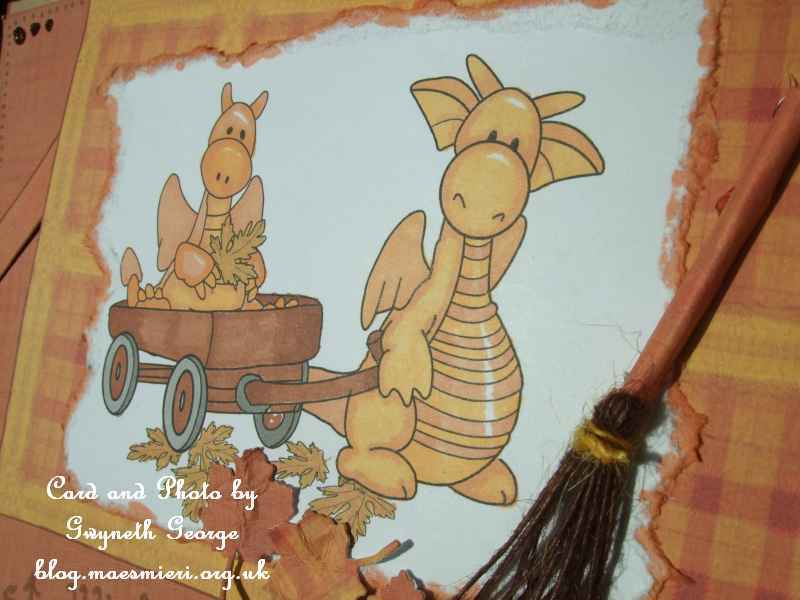 As it’s an Autumn theme for this month I couldn’t resist printing out Cart Ride Digital Stamp by Janette Padley again, colouring it in using autumnal colours using my ProMarkers, and matching it up with papers from the A Touch of Provence Card Papers, again by Janette Padley, to build up the card layers. The ProMarker colours I used were: Chestnut, Gold, Ginger, Pumpkin, Raw Sienna, Cool Grey 4, Cool Grey 5. 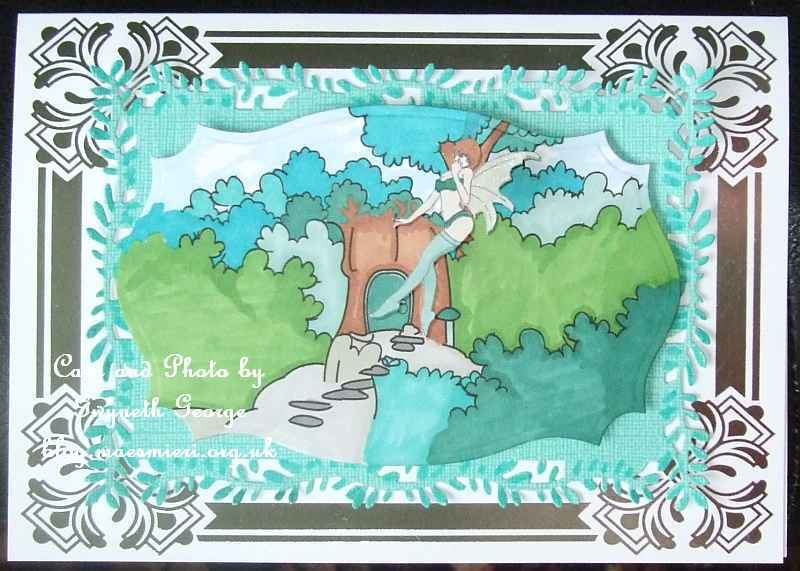 I tore around the digi-stamp panel after colouring it in and edged it with one of the ProMarkers I’d used on the image. 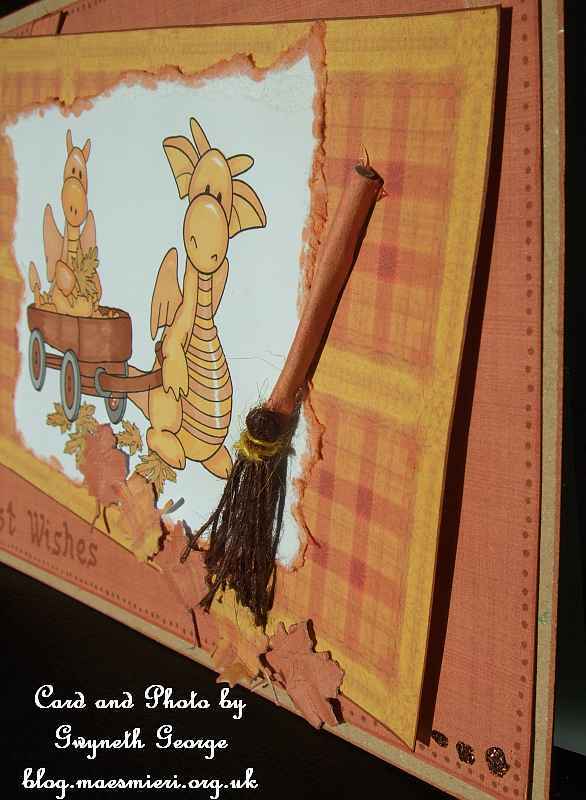 I made a cylinder from a piece of the backing and attached brown jute twine to it to make the broom and finished off with some die-cut leaves, again die-cut from the backgrounds used and realy scrunched up before attaching to the card front. For the October Card Swap I was involved in a three way swap. I was to send to Tina, Tina was to send to Zoe, and Zoe was to send to me. The theme for the October Card Swap was “HALLOWEEN” and this is the one that I sent Tina – I’ve built the design digitally before printing out, layering and constructing my card. 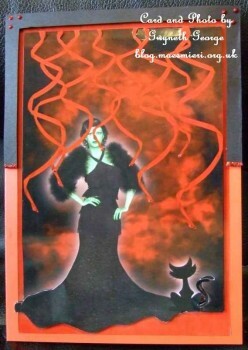 Front view of card – As it’s a Haloween theme for this month I thought I’d go “dark”. 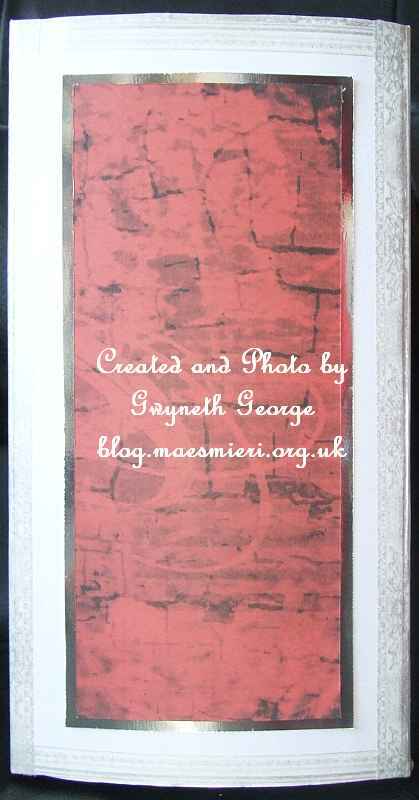 I took a redish background and red twirly ribbon from the kit Walk in the Park Mini Theme by Janette Padley a smokey background from the kit Smokey backgrounds by Nikola Middlemast, and a woman from kit Designer Resource Evening Dress Ladies by Gillian Hutchinson, into one of my graphics packages and duplicated the ribbon several times before resizing, it etc. I also changed the skin colour on the woman to a more green colour, gave her a cat and added a “halo” of light behind both. I played around with the layout until I was happy with how it looked before making a second layer by the side of the first and printing it out onto Glossy Crafty Bob paper. 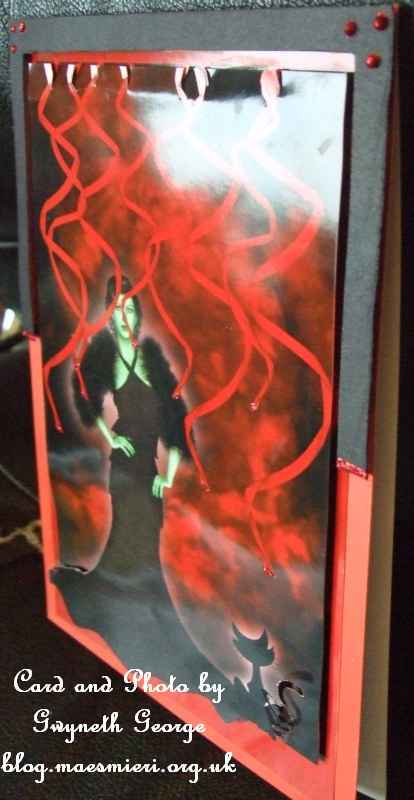 The base card was made by scoreing a red A4 sheet of Satin Board using my Hougie Board and folding it in half. I cut out both layers of my card front, cutting in a little at the top and bottom of the second layer around the ribbon top ends and the skirt of the dress and the cat at the bottom end. The base layer was stuck directly to the card fornt and 2mm deep double sided foam tape together with some glue gel was used to attach the second layer. 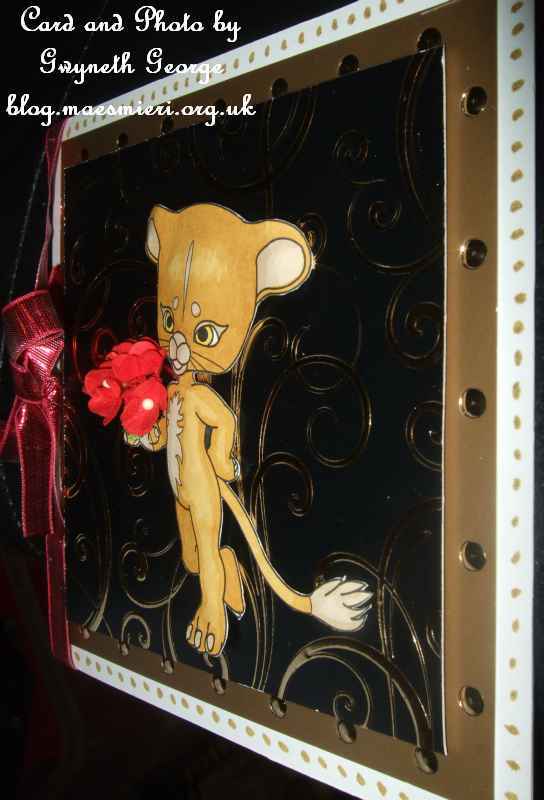 A border of black card was attached around the top of the card, also using 2mm deep tape. I finished off by adding some red glitter glue . 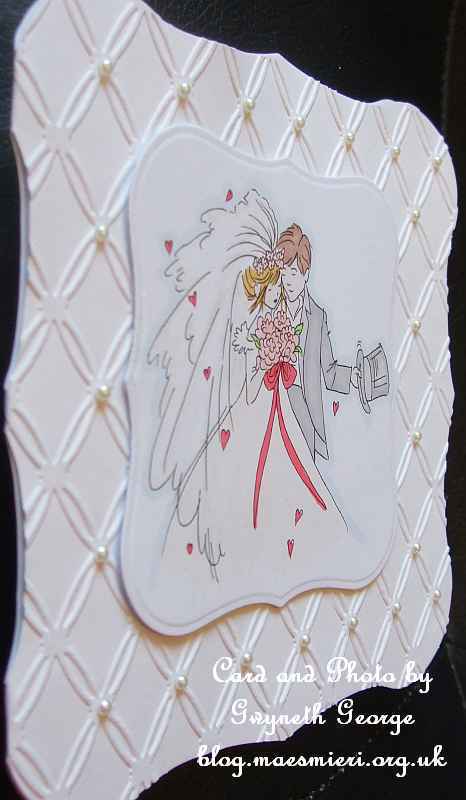 Side angle view of card. Wednesday, 27th November – Here! – LAST EVER 20% Discount Code & all the latest CUP News! I’ve not got a lot of anything to write this time, other than show you my latest bits of crafting. During the end of last week and over the weekend I’ve been working on a project to give as a Christmas gift. Also some assorted cards. 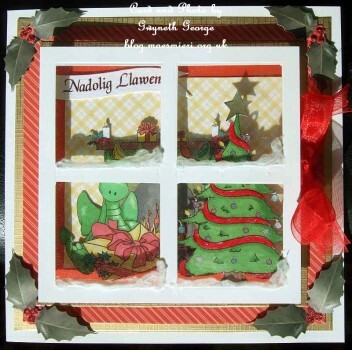 After my challenge entries there are even more of my creations for all my visitors to have a look at. I hope you like what I’ve made. I wonder if you can work out what this is? – without scrolling down to see the rest of the pictures! OK – I admit, that isn’t much of a clue is it! What about if I show you this photo? Got it now? If put on a shelf with this side out, rather than the “spine” side it looks more like mini magazine holders sorted side by side, but it’s not for magazines. 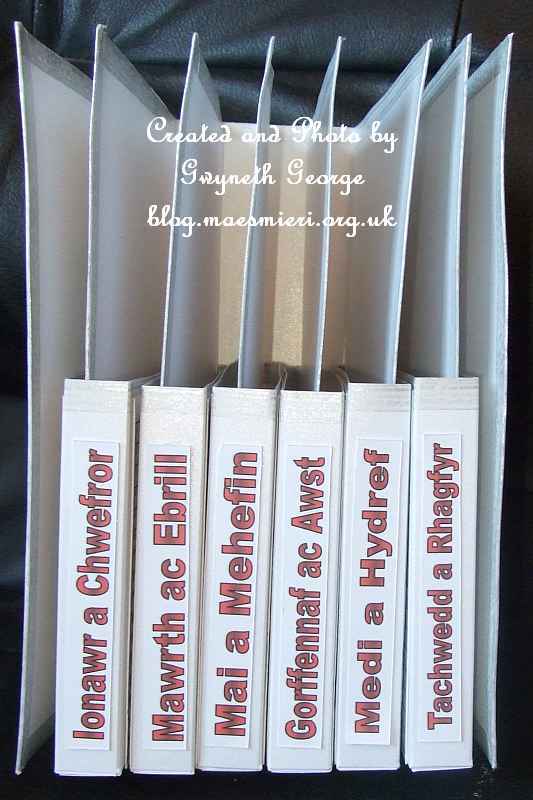 OK – it might be a bit more difficult for you if you don’t speak Welsh – but the word “Cardiau” on the front is Welsh for “Cards”. 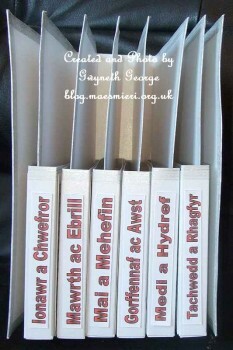 And the labels are the months of the year in Welsh. There you have it – the outside of the pockets have a panel with the dates of each month on for people’s birthday’s to be written on, and the pockets themselves hold an assortment of cards (I’ll also add the matching envelopes before packing). 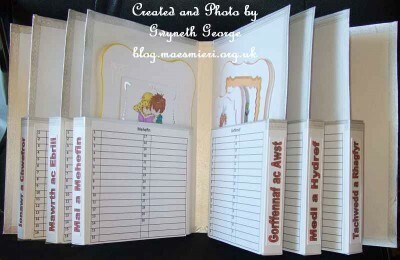 The recipient will be able to write in the dates of family birthdays, anniversaries, etc., and sort out the cards to suit people they may want to send cards to. 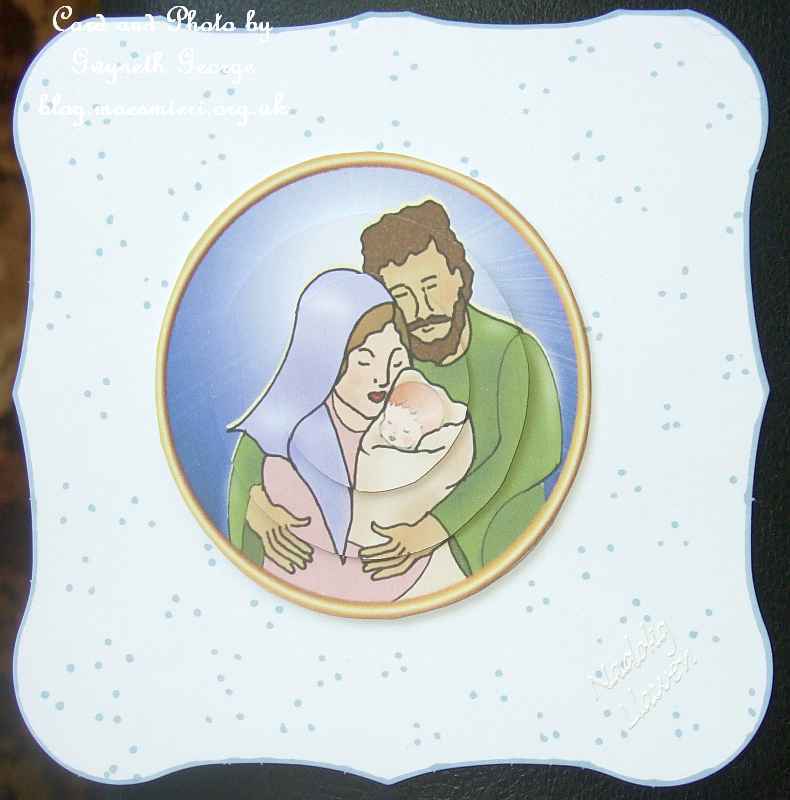 What could be better than a supply of hand made cards ready in the house? I used lots of A3 and A4 Centura Pearl Snow White cardstock to make my Cards Book, using my Hougie Board to score and ultra tacky tape and quick grab glue to attach the pieces together. I’ve gone around all the pieces with a silver patterned washi tape. 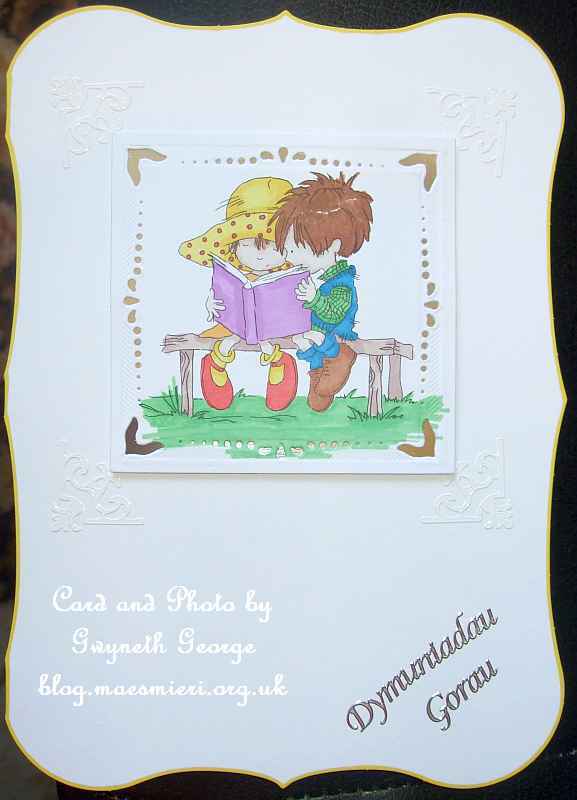 The outside is decorated with pieces of one of the backgrounds from Fun in The Sun Mini theme by Janette Padley printed onto 300gsm Super Smooth white cardstock and matted onto a piece of silver mirror paper before attaching to the Cards Book. For the image on the front I used Rupert Banner by Janette Padley, with the word “Cardiau” typed in before I printed onto Super Smooth white cardstock and coloured in using my ProMarkers. 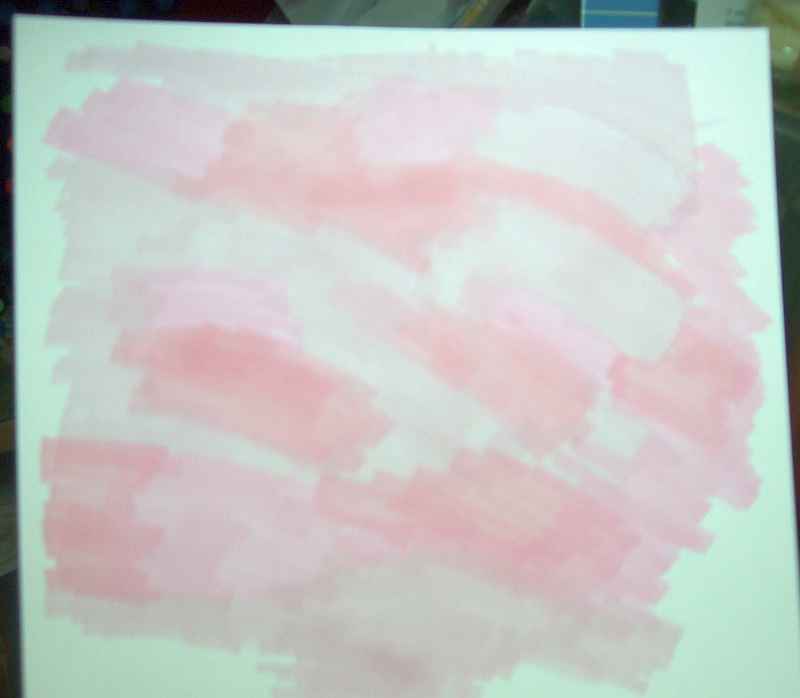 The colours I used were: Lipstick Red, Ruby, and Fresh Meadow. The cards I’ve made to put inside can be seen below. I’m planning to make up some boxes of different cards to give other family members, but the rest won’t be as elaborate as this one. Spmething for you keep an eye out for on my blog in the next couple of weeks. 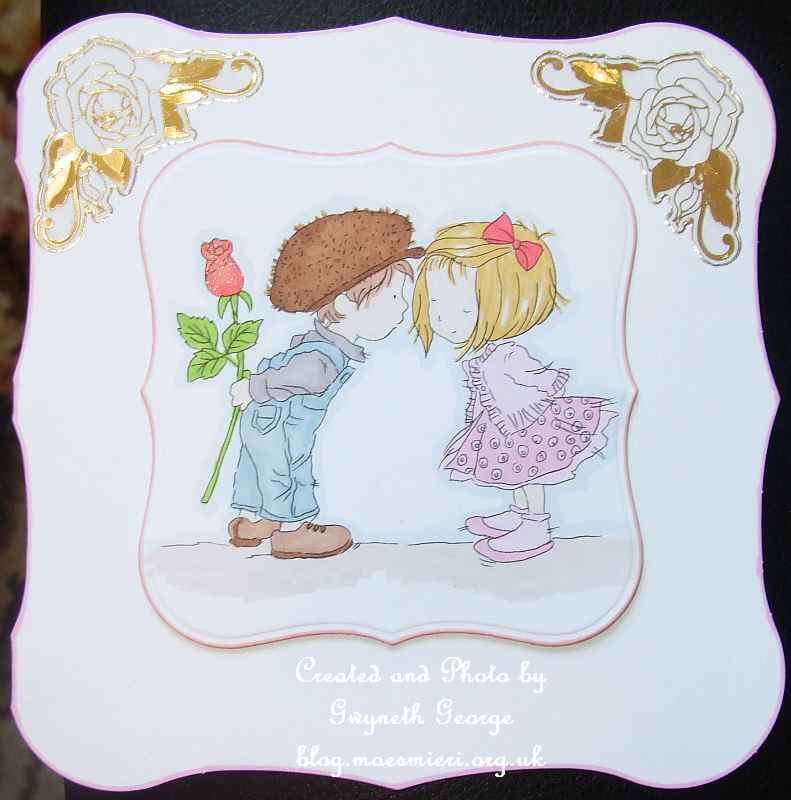 Every one of the cards that will be included in the Card Book were made up using base cards that came as a pack of different sized cards with matching inserts and envelopes from Debbi Moore Designs. Unless otherwise stated, all the images are from a “Collection of 3, A6 Black and White Sketch Pads” of Lili of The Valley images. I’ve also had my Joy machine out to die-cut a shaped topper panel of the coloured in images. A lot of the cards have been left without greetings as they could be used for different occasions. I intend to put a cello bag with different greetings in Welsh and English into the Card Book with the cards and envelopes so that a suitable greeting can be added before the card is used. Coloured the image in using my ProMarkers. The colours I used were: French Navy, Canary, Yellow, Tan, Tawny Owl, Burnt Sienna, Cocoa, Gold, Satin, Grass, and the Wild Orchid FlexMarker. 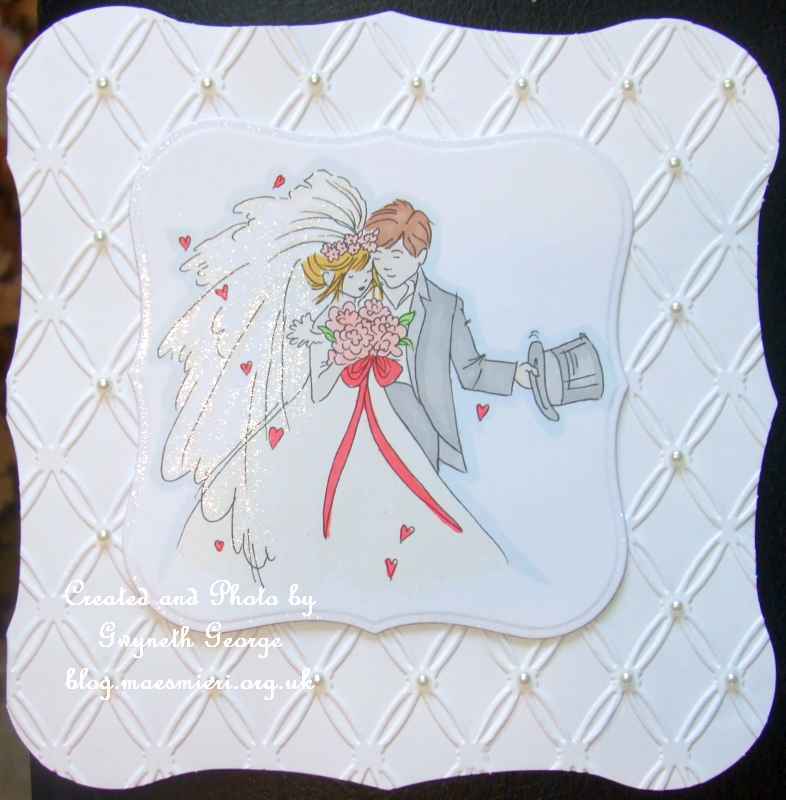 The image was then cut out using a Spellbinders Gold Square die and a Spellbinders Square die . A piece of silver foil paper was stuck behind and cut to the same size as the image square. 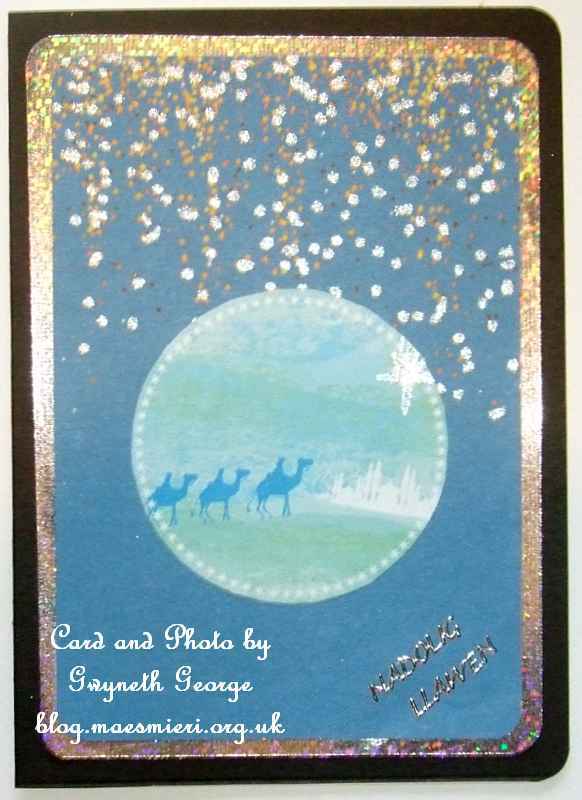 I used 1mm deep, double sided, foam tape to attach this to the card front, put white corner peel-offs at each corner, and put a greeting “Dymuniadau Gorau” (which is Welsh for “Best Wishes”) in the bottom right corner. 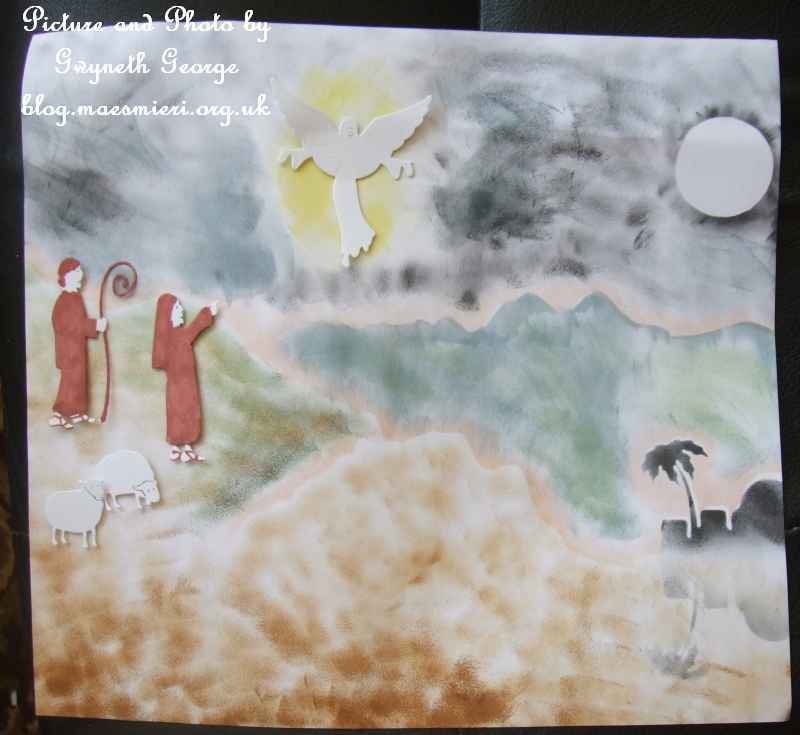 I then finished off the card by going round the edge with the yellow ProMarker I’d used on the image. Same card at a slight angle. 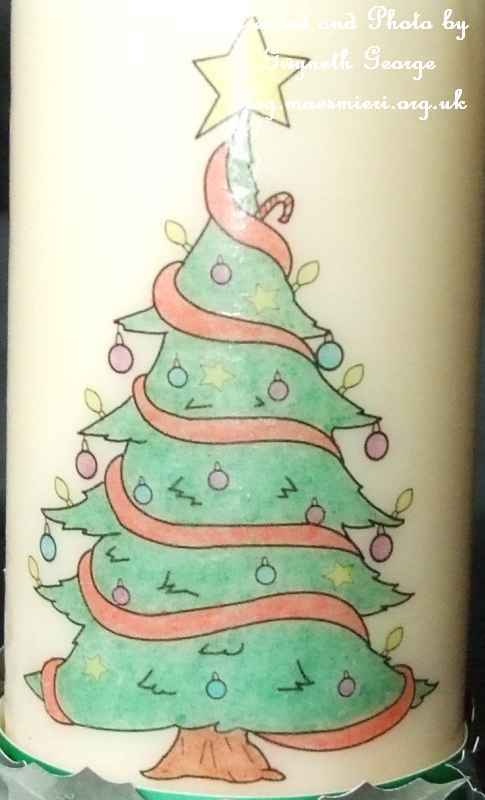 This image was coloured in using Cool Grey 2 and 3, Ivory, Pastel Pink, Leaf Green, Lipstick Red, Satin, Sleigh Bell, and Cinnamon ProMarkers and clear Wink of Stella. 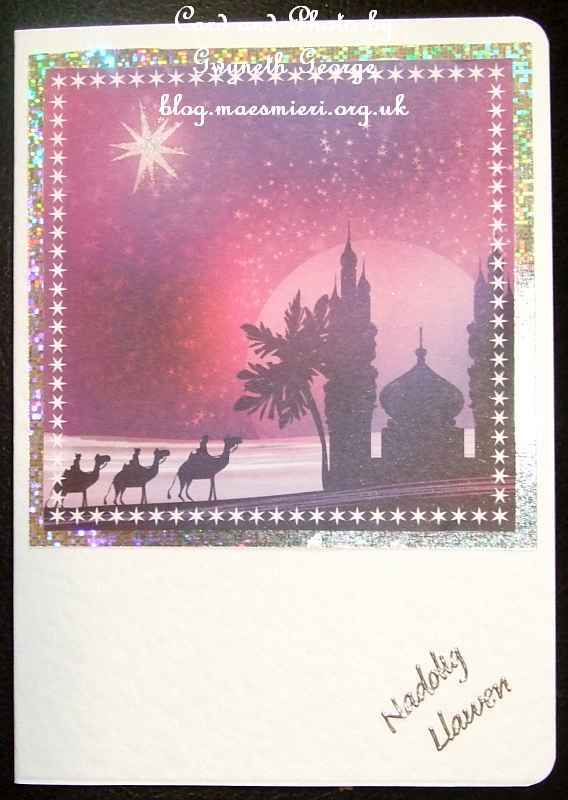 The panel was cut out using a Spellbinders label 1 die and attached with 1mm deep, double sided, foam tape to the front of a card, that I’d embossed using an embossing folder. The card was finished off with some small sticky back pearls. 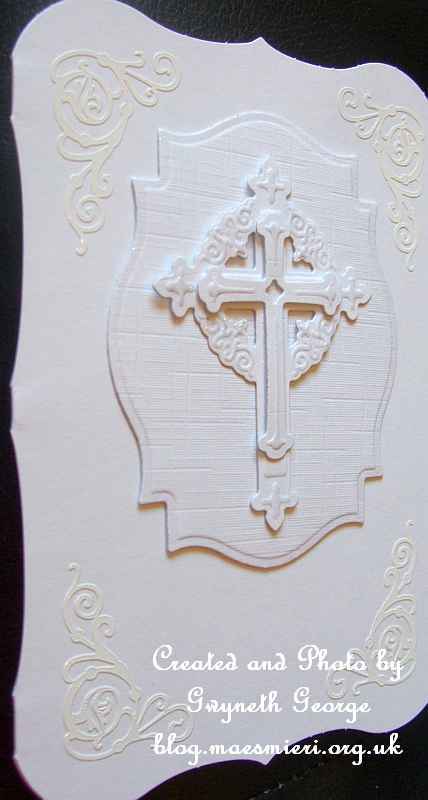 Previous card at an angle showing the minimal dimension given by the embossing and foam tape. 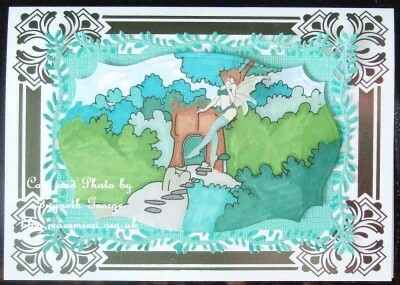 This image was coloured in with ProMarkers of colours: Meadow Green, Chestnut, Cocoa, Yellow, Pastel Pink, Satin, and FlexMarkers of colours: Lemon Chiffon and Celestial Blue. 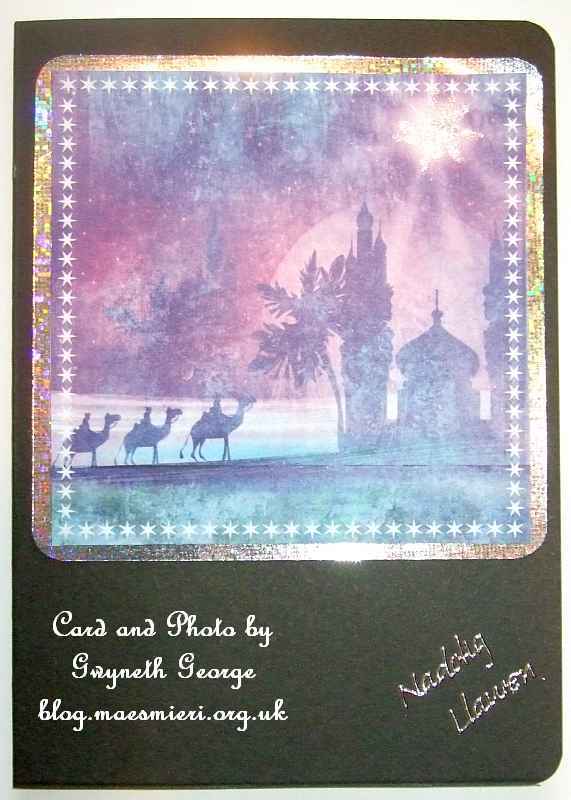 I used Spellbinders label 18 die to cut out the coloured in panel. 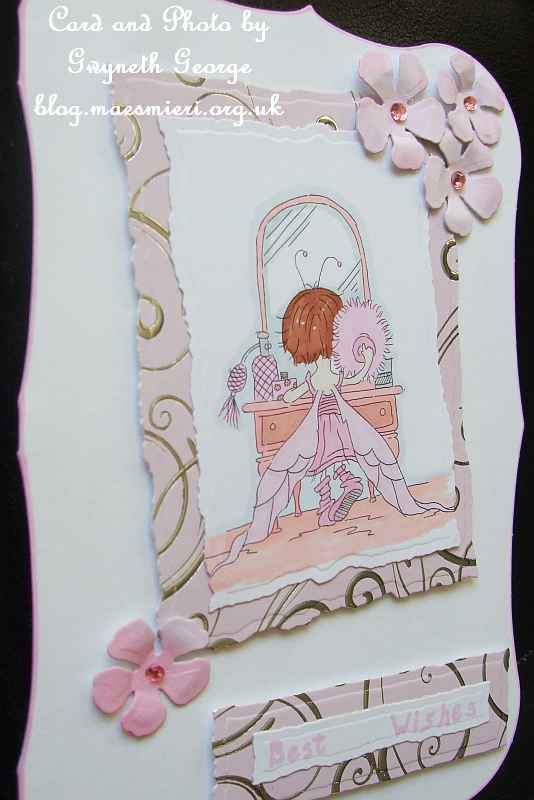 I went round the edge of the panel and the base card with the pink ProMarker I’d used on the image, and then used Clear Wink of Stella both over the embossed margin of the image panel and over the wings and flower centres on the image itself. 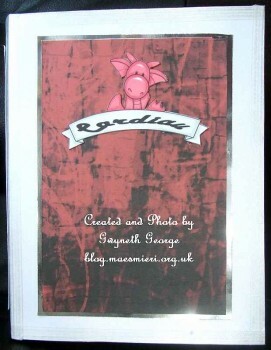 1mm deep, double sided tape was used to attach the coloure in image to the card front. This card is all in white. 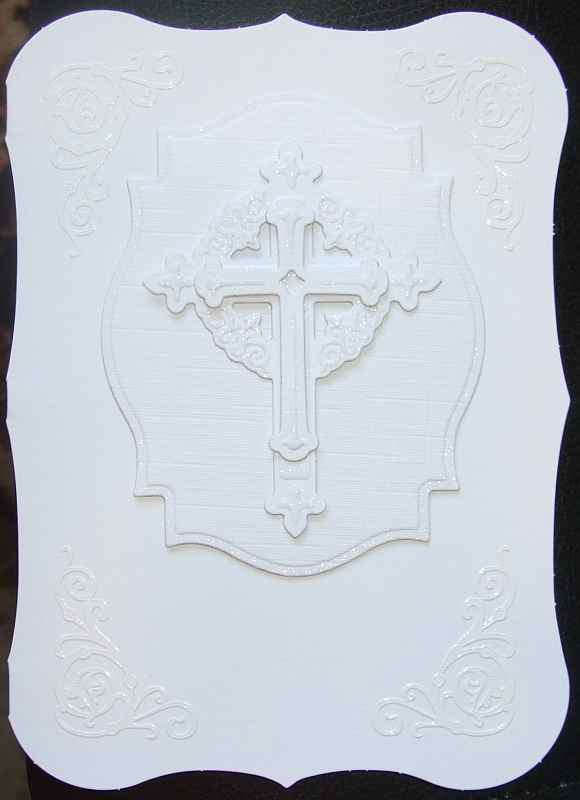 White peeloffs in each corner and die-cut Spellbinders label 18 and Spellbinders crosses cut from linen textured white cardstock with the panel being attached using 1mm deep, double sided tape and each cross layer being put on using glue gel. I went around the panel edge with Clear Wink of Stella, as well as some details on both the cross layers. A different angle of the previous card. I printed digi stamp “Jiggy Dragon” by Janette Padley, at smaller than the size provided, onto Super Smooth white cardstock and coloured in using my ProMarkers. The colours I used were: Lipstick Red, Ruby, and Fresh Meadow. 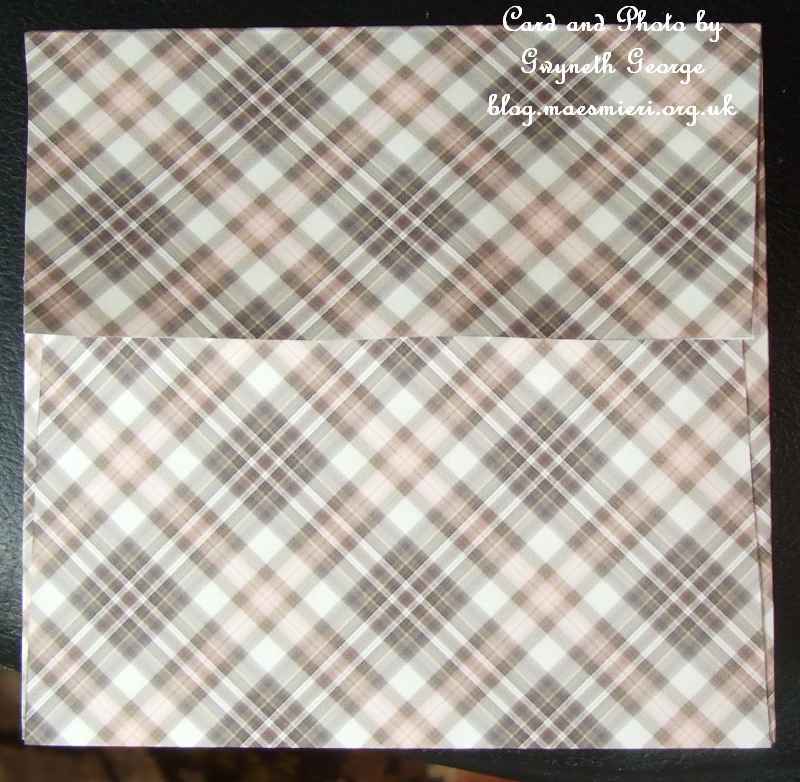 I also printed out one of the backgrounds from the “Fun in The Sun Mini theme” kit by Janette Padley onto another sheet of the same type of cardstock. 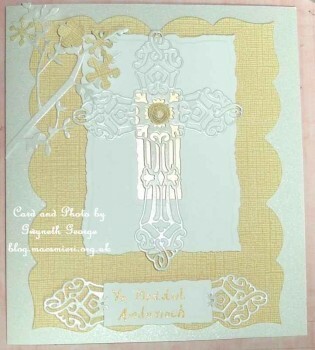 The image was cut out using a Tonic circular Celtic die and the background using a Tonic square Celtic die . 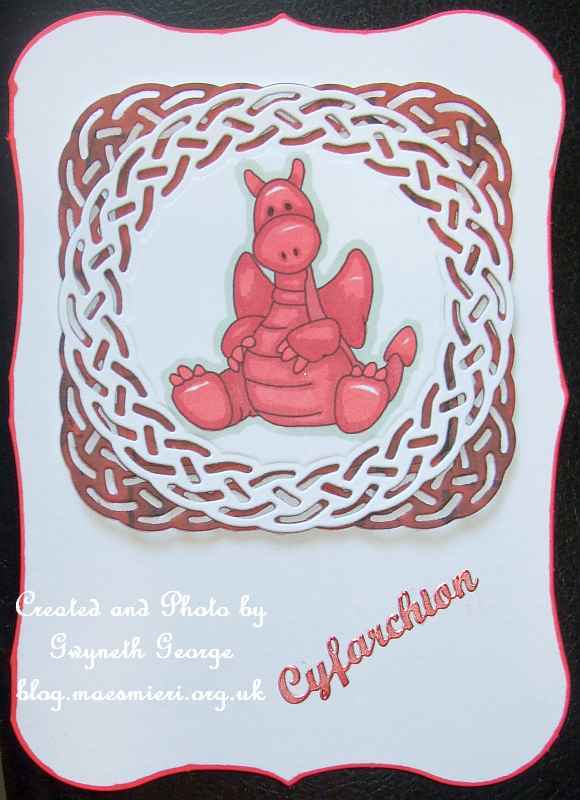 I went round the edge of the base card using one of the ProMarkers used on the image, and also coloured in a “Cyfarchion” silver peel-off (Cyfarchion being Welsh for Greetings) before attaching it to the card front. I used finger-lift tape to attach image to mat, and 1mm deep, double sided, foam tape to attach matted image to card front. 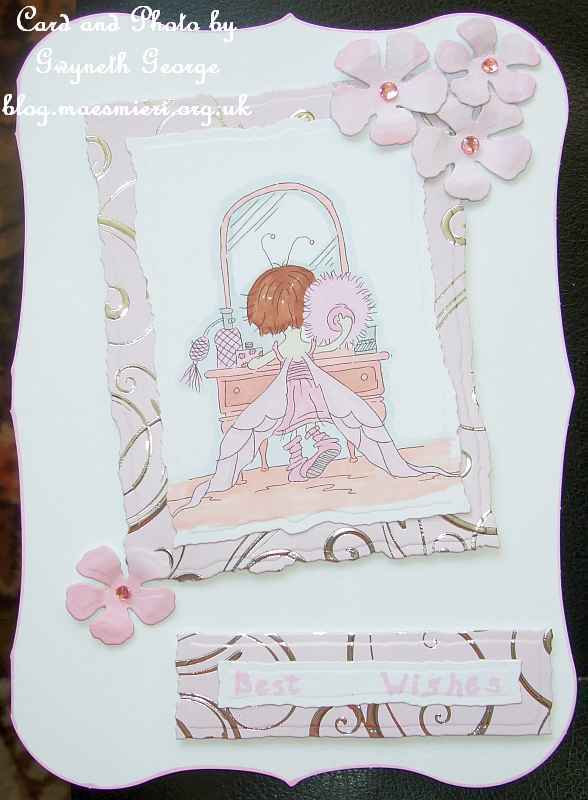 The decoration on this card is built up of a die-cut frame and some flowers, together with some sticky back coloured pearls and some sticky back glitter flourishes. I’ve left the panel empty so that it can be used for any occasion. 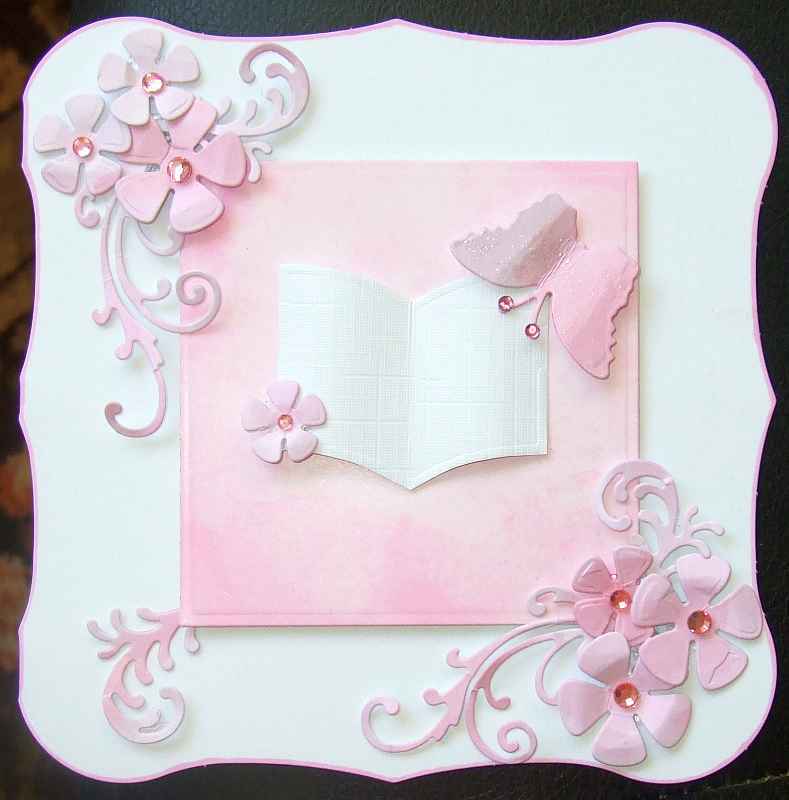 The double flower layers were cut using dies from a Spellbinders die set and the single flower with a Joy die. 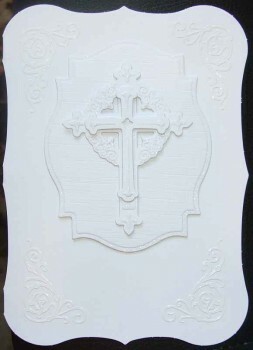 The frame was also cut using a Joy die . 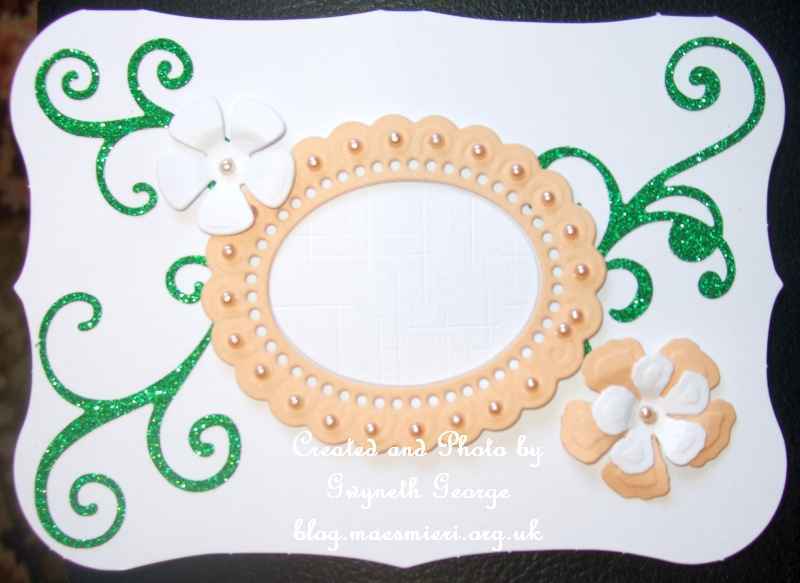 This card was finished off using sticky back faux pearls and some glitter flourishes from my crafting stash. 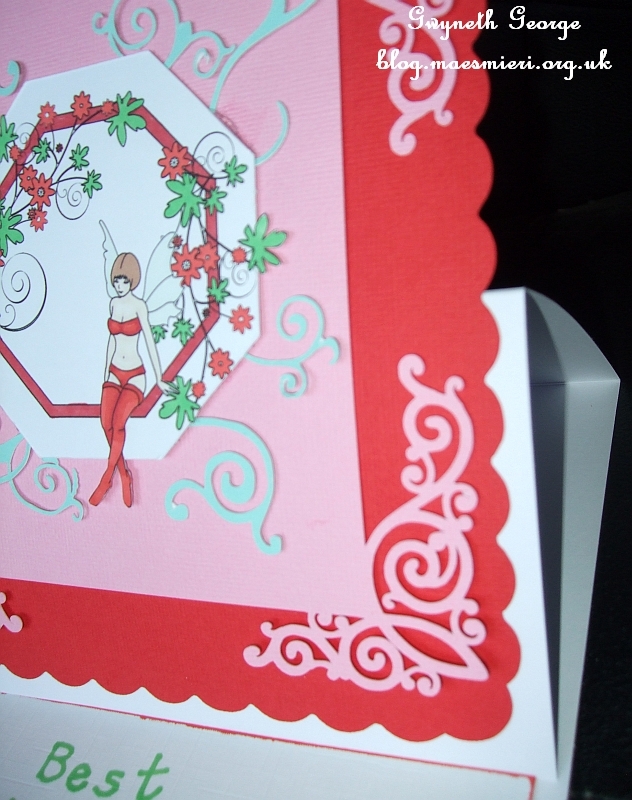 An angled view of previous card showing minimal dimension on card. The ProMarkesI used to colour this were Grass, Cool Grey 4 and 5, Black, Amber, Satin, Tulip Yellow. I also used Honeydew FlexMarker and Gold and Clear Wink of Stella. 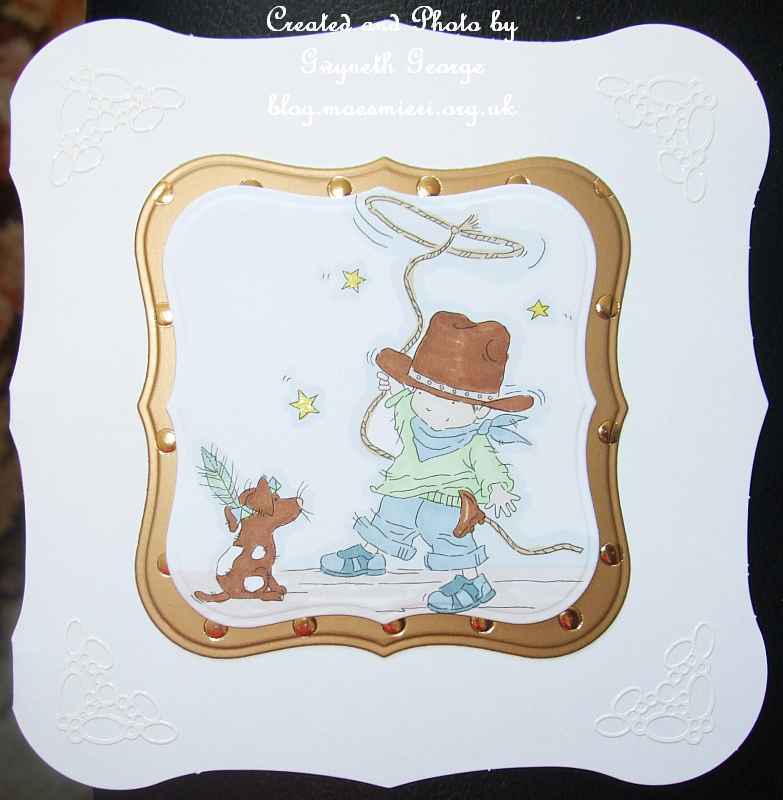 I cut out the coloured in image using Spellbinders Labels 29 using my Joy cutting and embossing machine. I also used a larger die from the set to cout out a toneing mat to go behind it. 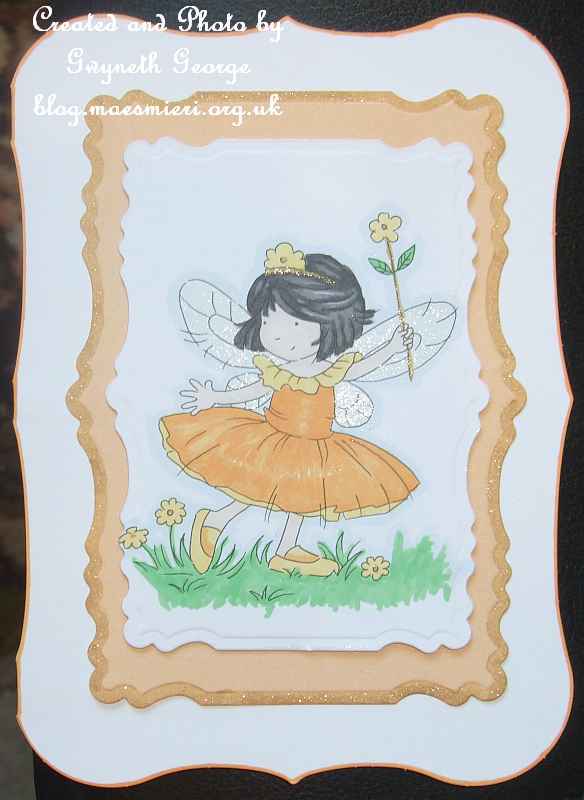 I went round the edge of the peachy coloured layer using gold Wink of Stella and around the outside edge of the base card with a ProMarker I’d used on the image. I then used finger-lift tape and 1mm deep, double sided foam tape, to attach the pieces together. I embossed the front of the base card for this one, then added a panel, flowers, flourishes and a butterfly that I’d die cut using my Joy machine. 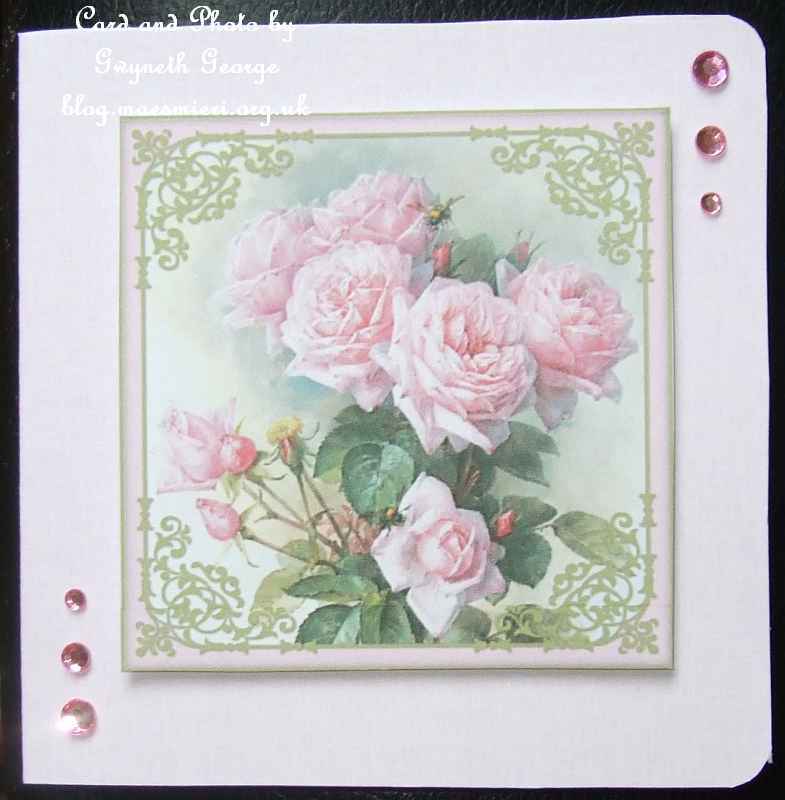 The flowers are cut using dies from a Spellbinders die set . 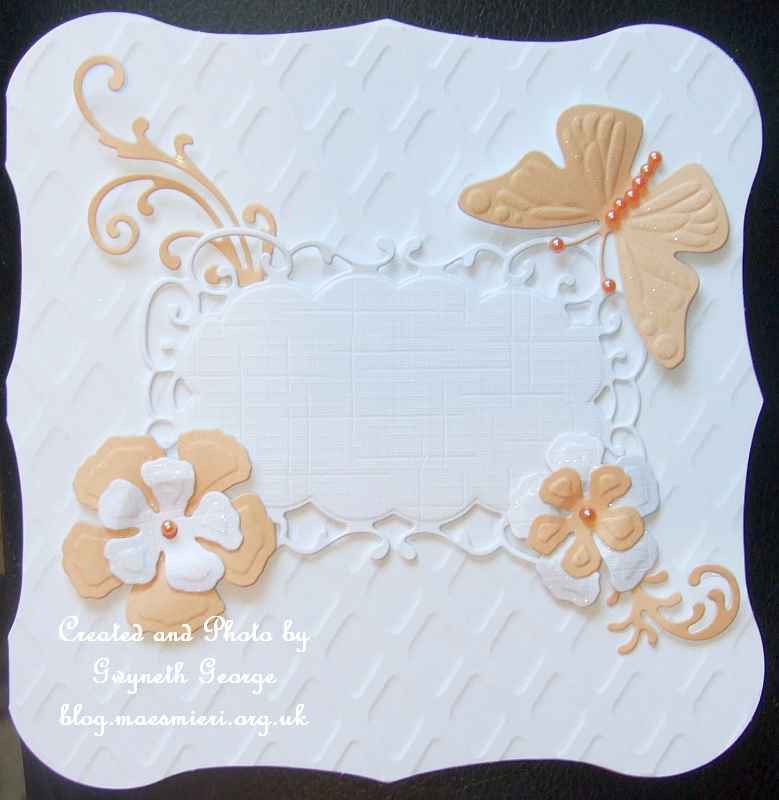 The panel and flourishes are a Marianne die set and the butterfly is from a Joy butterfly die set . 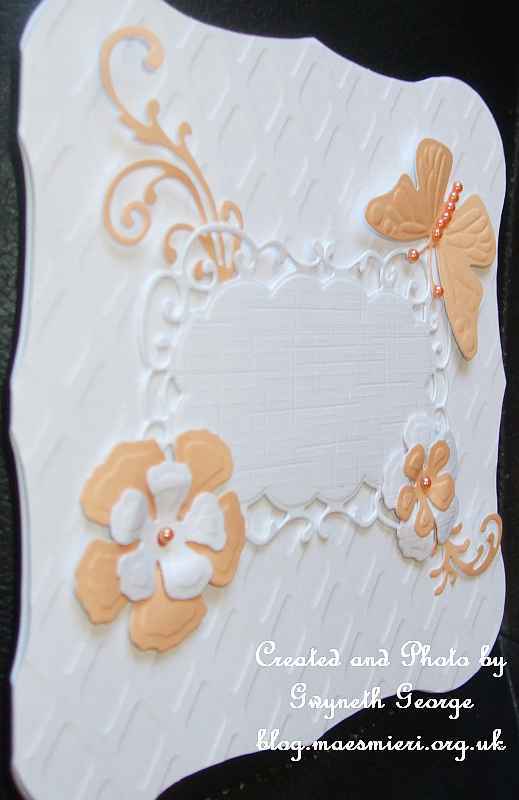 I finished off with some sticky back pearls and brushed a clear Wink of Stella brush pen over the embossed details on the butterfly and white flower layers. An angled view of previous card showing that the card has a little dimension. The ProMarker colours I used were Cool Grey 5, Grass, Canary, Cinnamon, Cyan, Satin. 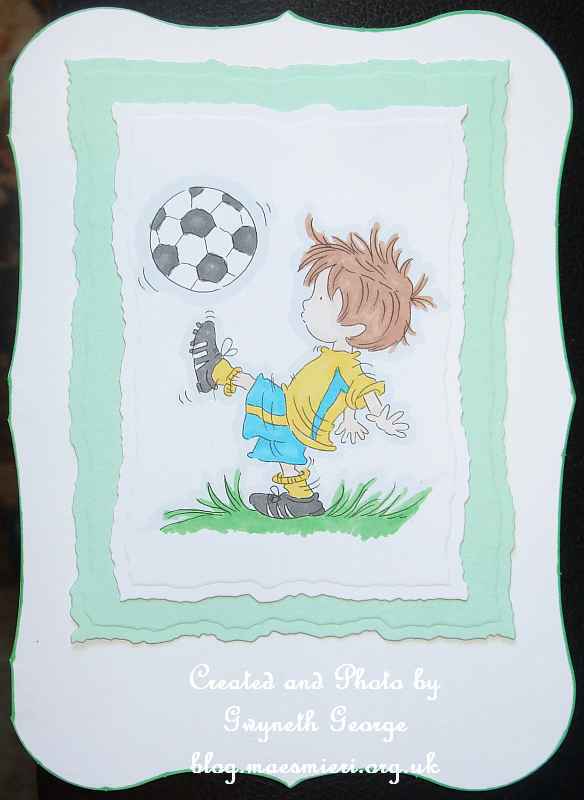 I used a couple of dies from the Spellbinders Distressed Edge set to cut out both the coloured in image and a green mat to put behind it. I used the green ProMarker that I’d used when colouring in the image to go round the outside of the base card before I attached the elements to the card. This time the ProMarkers I used were: Morning Mist, Meadow Green, Yellow, Twilight Sky, Satin, Denim Blue, Pastel Pink, Burnt Sienna, and Sandstone. 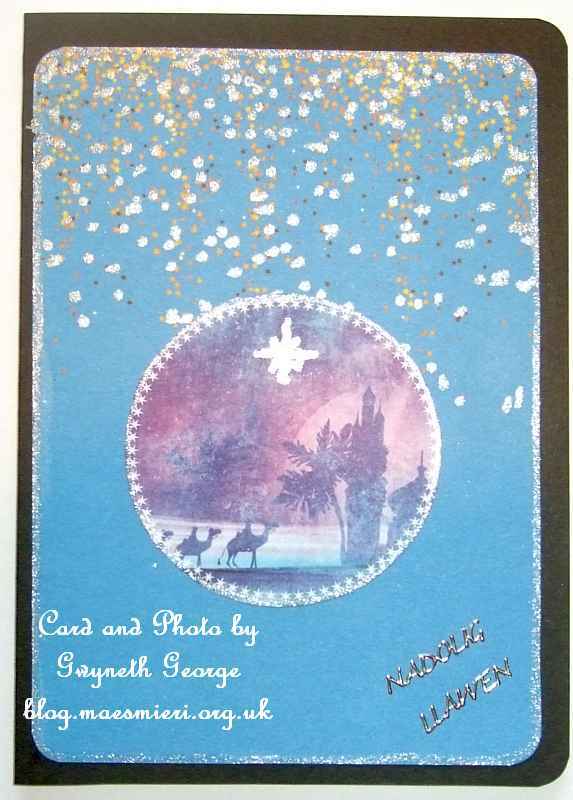 This was cut out using a Spellbinders label 1 die and also a mat was cut from some embossed/foiled Adorable Scorable cardstock using a large die from the same set. As for other cards in this batch I used finger-lift tape and 1mm deep, double sided foam tape to attach the image and mat. 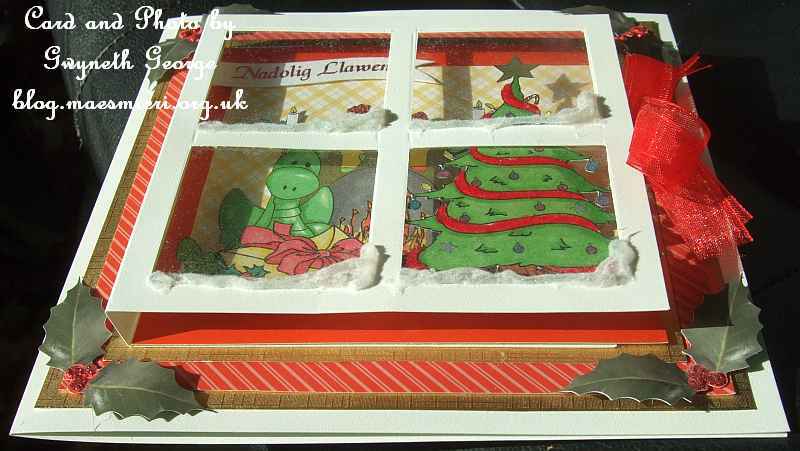 I finished off by putting some white corner peeloffs on the card front. The ProMarkers used to colour this image were: Morning Mist, Satin, Lipstick Red, Burnt Sienna, Winter Berry, Bright Green, Rose Pink, Blossom, Cinnamon, Denim Blue, Sleigh Bell. 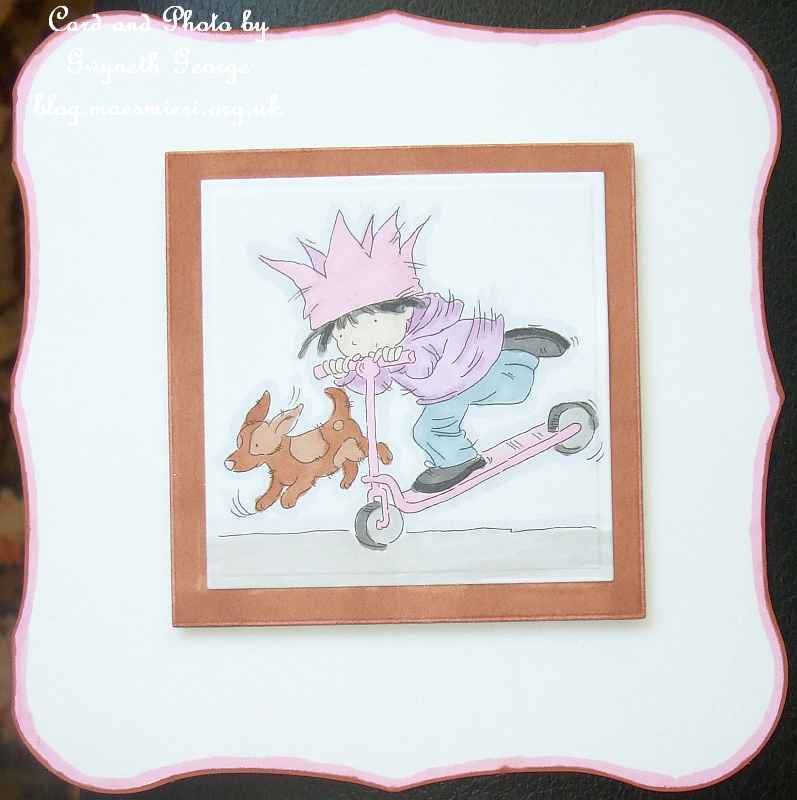 I cut the coloured image panel out using a Spellbinders label 1 die and went round both the edge of the panel and the card itself using pink ProMarkers I’d used on the image. 1mm deep, double side, foam tape was used to attach the coloured image panel to the card front and I finished off the card by attaching some roses corner peel-offs. I’m thinking that this would be a nice engagement card, as well as a “be my Vallentine” card. 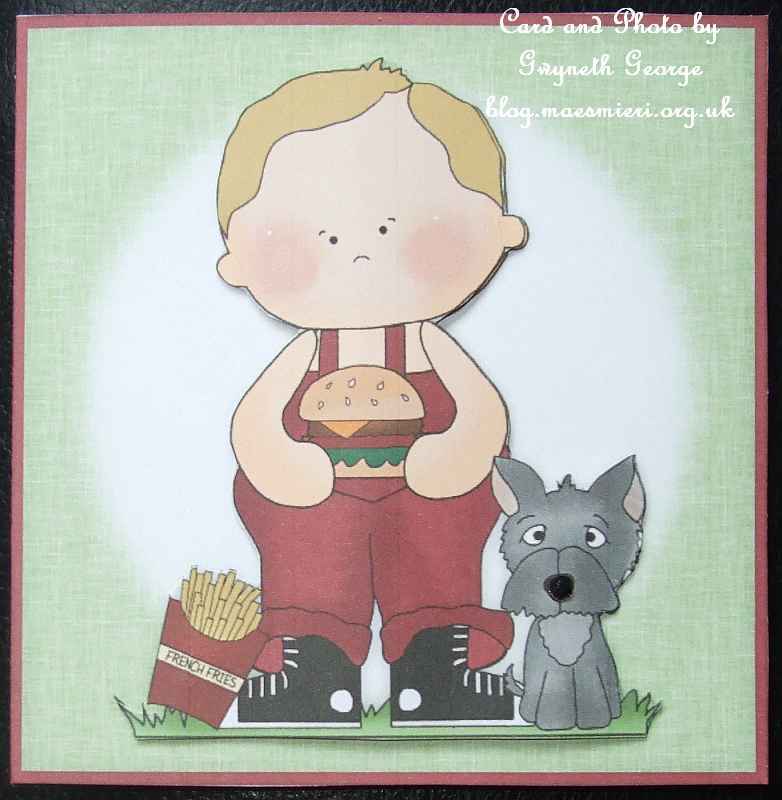 Cut out using Spellbinders labels 25 and matted onto a dark brown cardstock cut using a larger size die, this image was coloured using Pastel Pink, Sandstone, Burnt Sienna, Bright Green, Satin, Black, Cinnamon, Pear Green, Denim Blue, Morning Mist, Cool Grey 2 and 4 ProMarkers, and Antique White FlexMarker. I used finger-lift tape to attach image to mat, and 1mm deep, double sided, foam tape to attach matted image to card front. 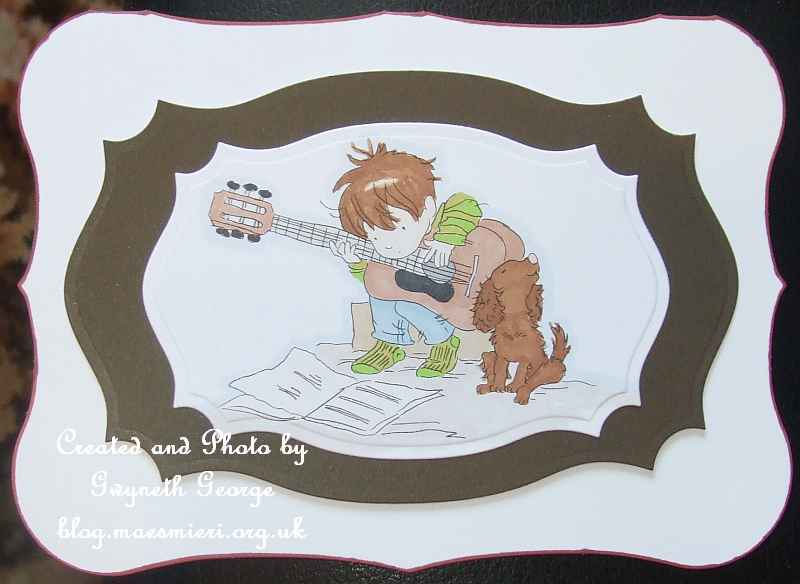 I went round the edge of the card using one of the brown colours I’d used to colour the image on the card. 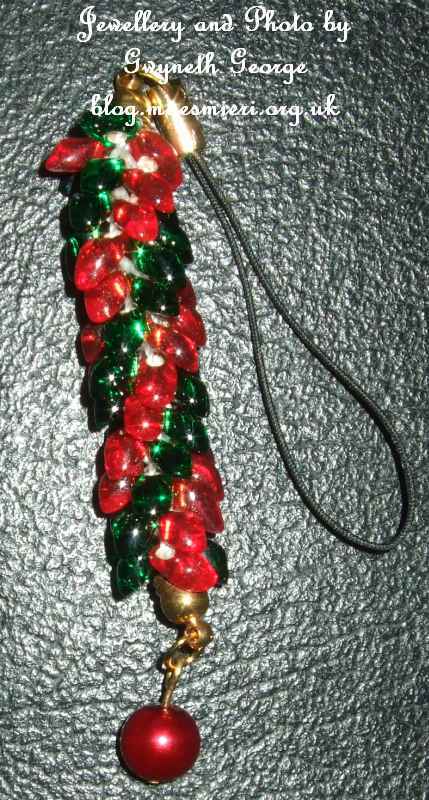 This first three are beaded Kumihimo using red and green Magatama beads. 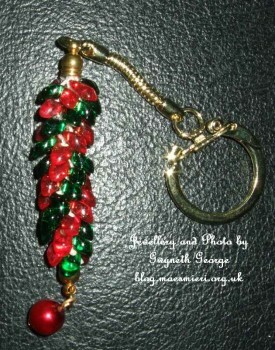 Each piece has an end cap on either end and a red glass pearl on a head pin as a charm on the bottom. The tops of each one are attached to a different type of finding. So that’s another three cracker gifts made and ready to go in the crackers when I make them. 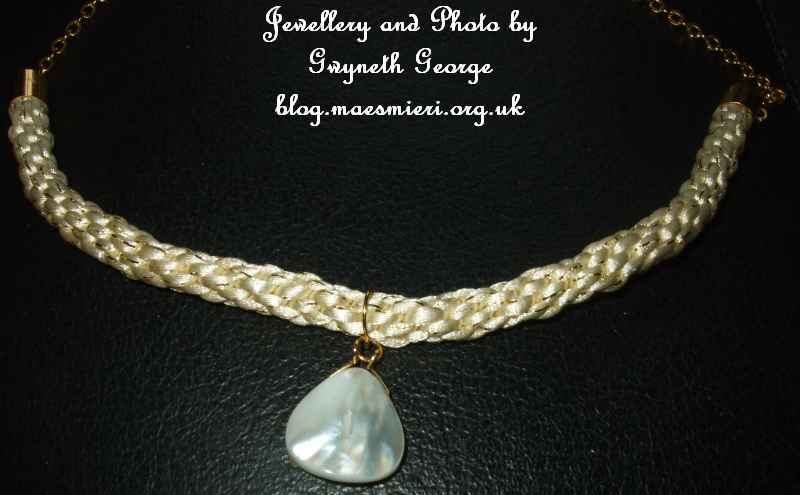 This necklace is made using a twisted cord, that I bought some time ago and put into my crafty stash waiting for an idea of what I wanted to use it with, and a set of Kumihimo Findings. Onto the pendant slide I attached five purple glass pearl beads that I’d hung on ball end headpins and cut to a couple of different lengths before rounding the top. 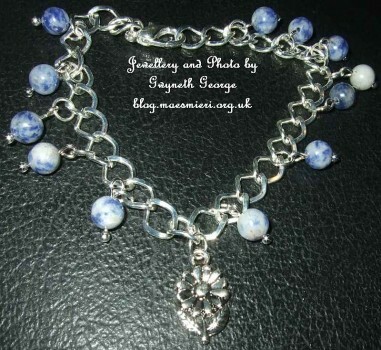 Two different sized Sodalite beads from my crafting stash threaded onto stretch beading elastic to make a bracelet. 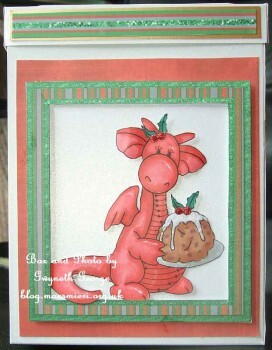 I’ve finally finished making up a card for the “colouring in” challenge on the “Stamping Dragon Designs” Facebook group. I’ve had the image coloured in for ages, and collected the other bits for my card several days ago, but only finished putting the card together this morning. 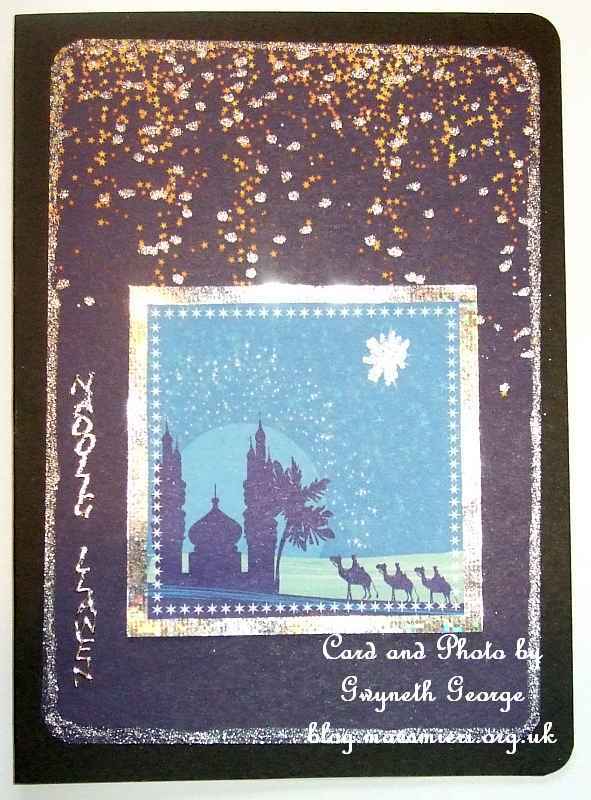 It’s not as if it’s a complicated card, just that I was distracted with other crafting and other things – most of which are “works in progress” so not ready to show you yet. I’ve got so many things on the go, and so many ideas in my head, of things I want to make for Christmas – but of course, as I’m fishing out things to make my Christmas gifts I see other bits and have a flash of inspiration and then I just have to have a go at making something else. 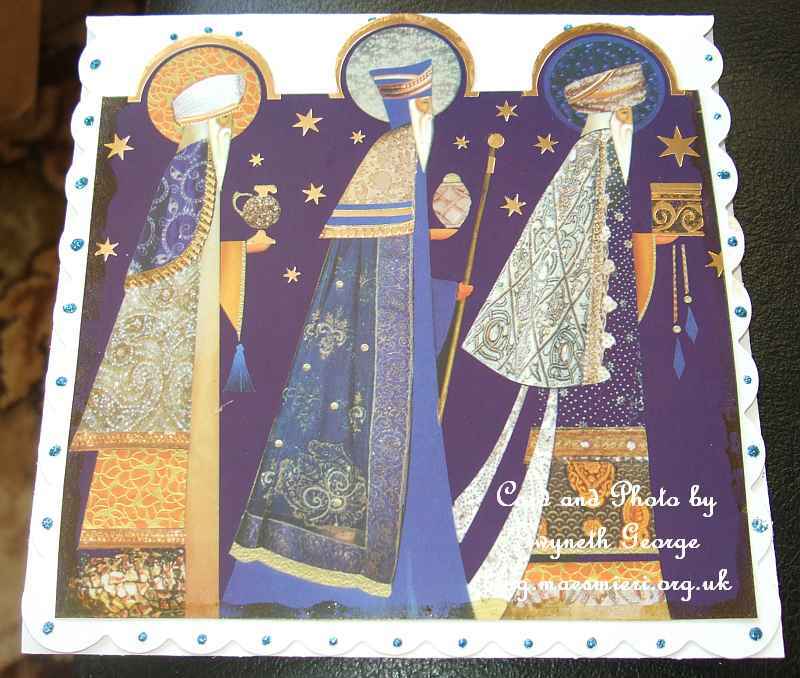 Mind you, you will find a batch of Christmas cards I’ve made, from free images from a magazine I’d bought lately, in this blog post, as well as some jewellery, so it’s not as if I’ve not done anything for Christmas. 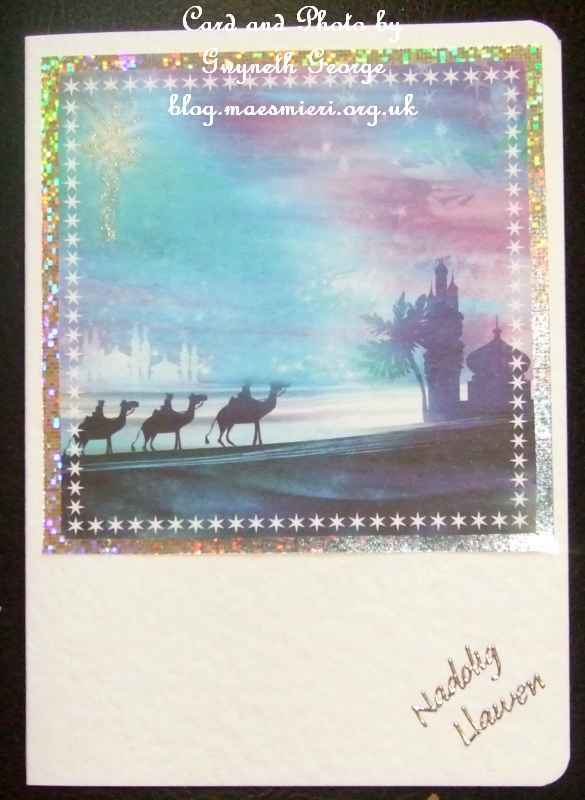 As the shine of card and foiling gave a bit of a whiteout on the photo of the card straight on I took another photo at a bit of an angle to show the real colours. An angled view of the card showing dimension. 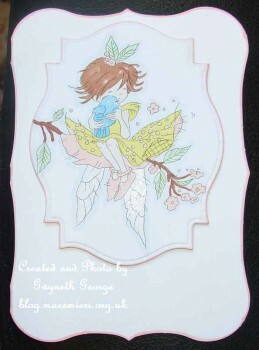 A batch of cards made using backing papers and toppers from the latest issue of the “Making Cards” magazine. 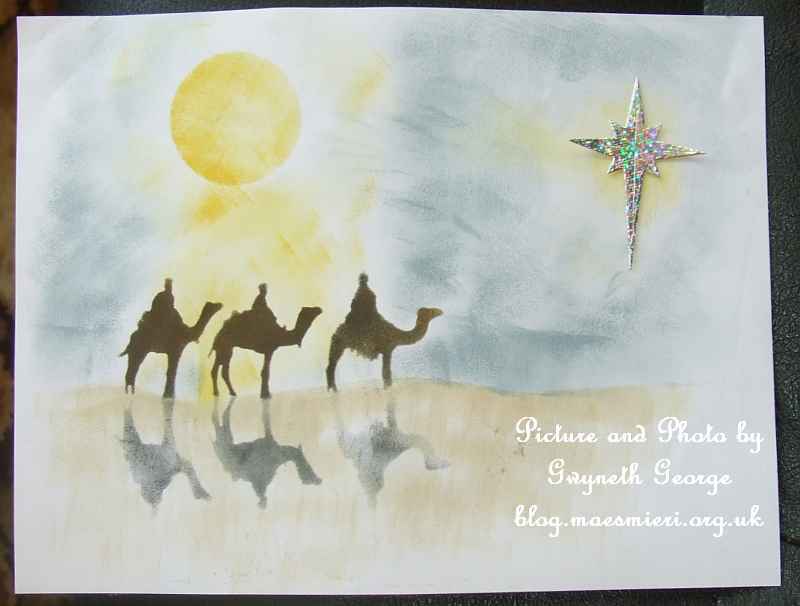 I went over the main star in each image with a Glitter Shake Silver pen, as well as dotting the same pen over the spotted area of the provided backgrounds so that the cards glitter when moved in the light. Most of the cards are A6 in size made from either hammered white, or matt black, base card, though the first two are larger. I’ve used silver holographic paper as a layer behind the elements on most of the cards, and finished off with a “Nadolig Llawen” peel-offs – which is Welsh for “Happy Christmas”. 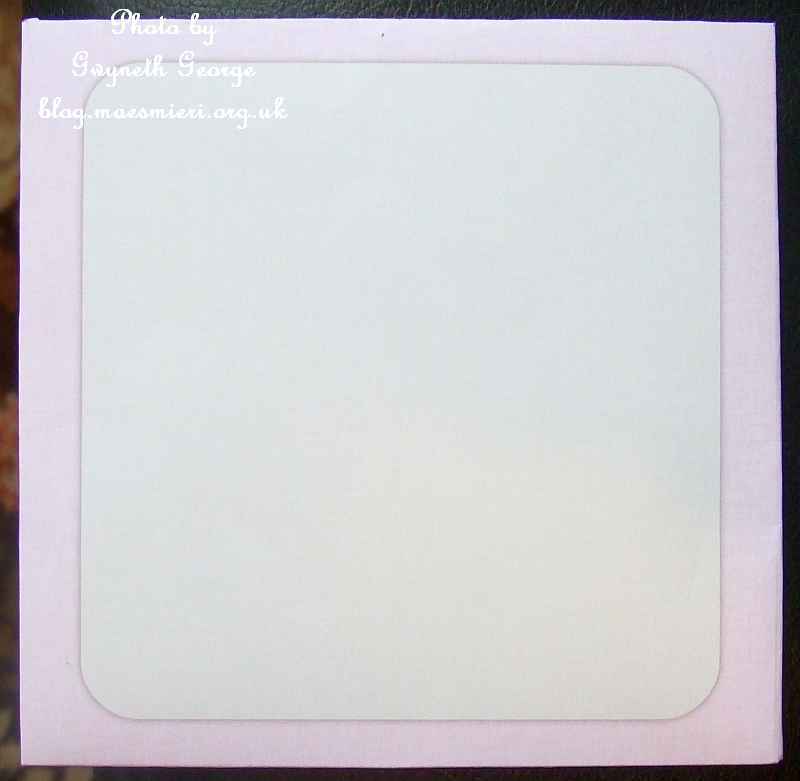 These are all stuck together using finger-lift tape to make sure that every one will go through the UK post on an ordinary letter stamp – the family and friends who buy cards off me really don’t want to have to go up to a Large Letter, or more, stamp for posting so only want more dimensional cards for hand delivery, not posting. 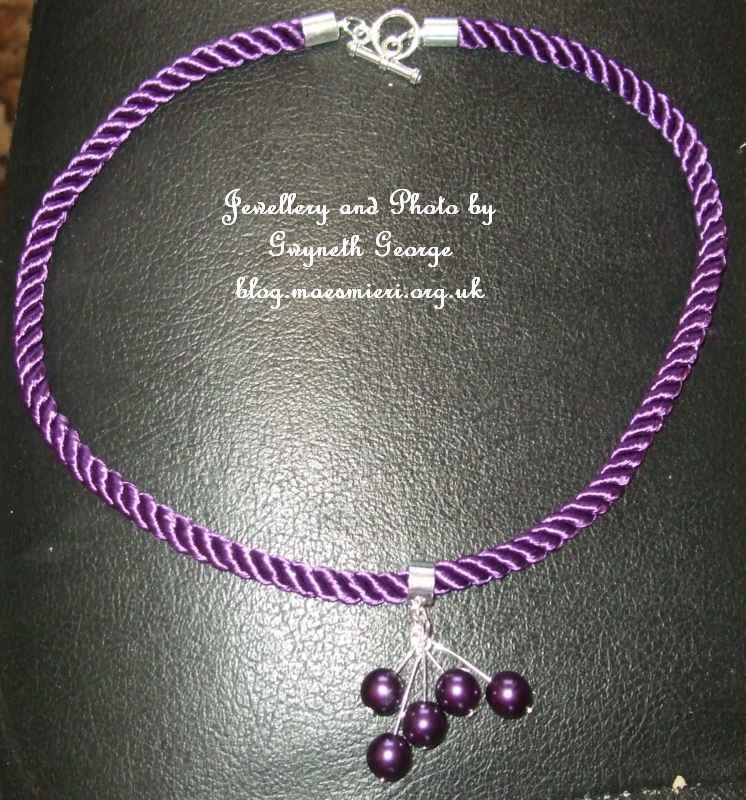 This is a set of neckalce and bracelet made from a kumihimo card created from one colour of rattail cord – a 2mm Rattail Satin Cord Thread. The ends of the cord are glued into gold end caps using Zap glue. I’ve then added magnetic clasps with jump rings. 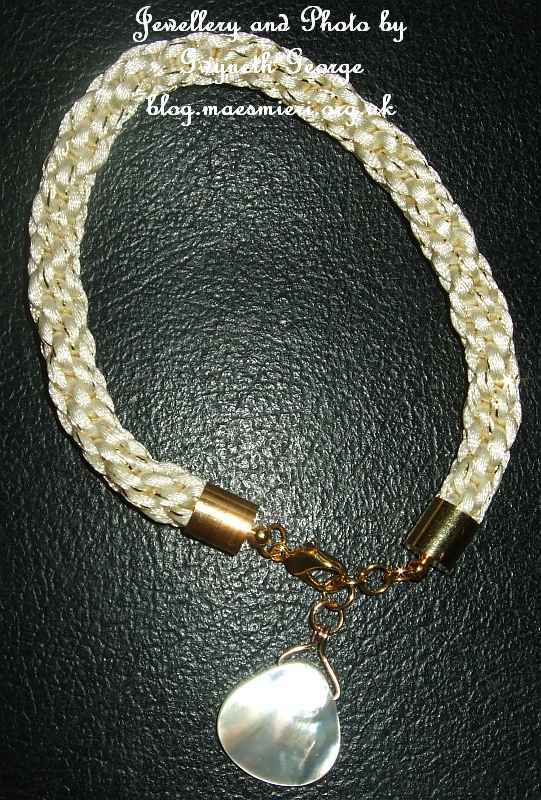 Closer look at bracelet and the kumihimo cord detail. 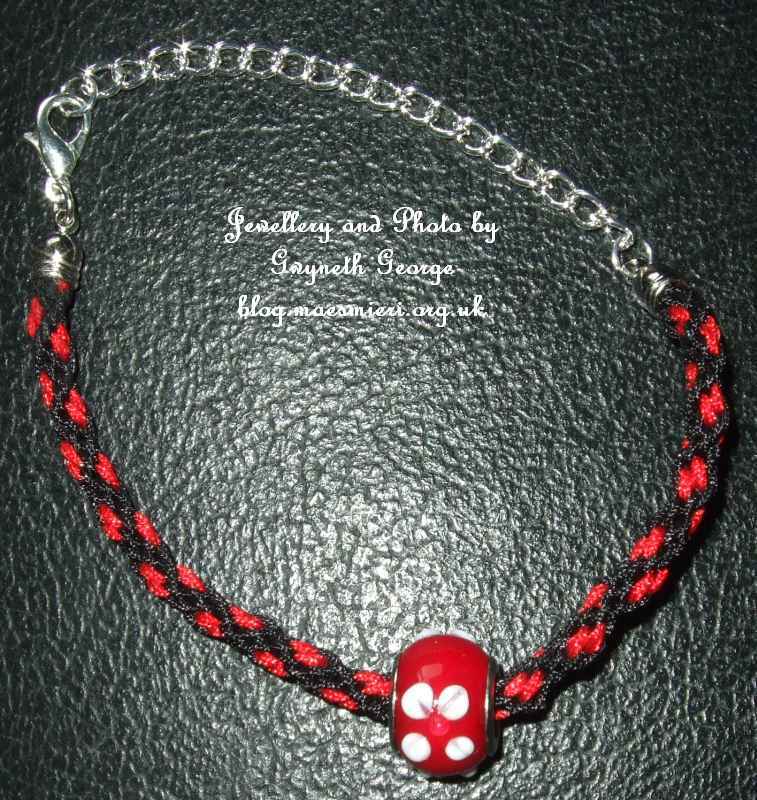 This is a quick charm bracelet made with items that have been in my crafting stash for a while. The chain was bought with the clasp already on it at a standard bracelet length. 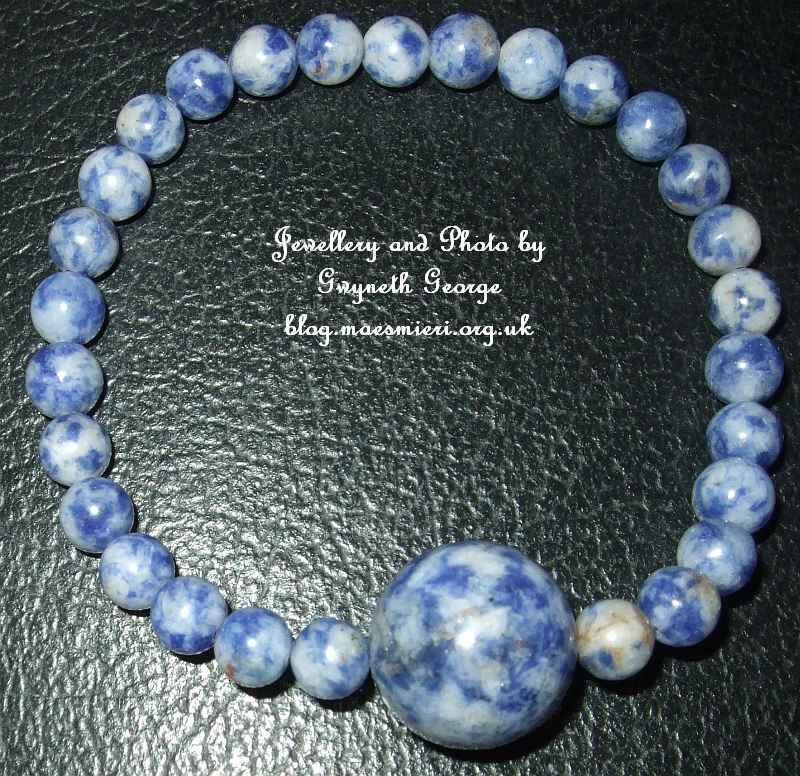 I put sodalite beads onto ball head headpins and looped the ends to make an eye using a looper tool. 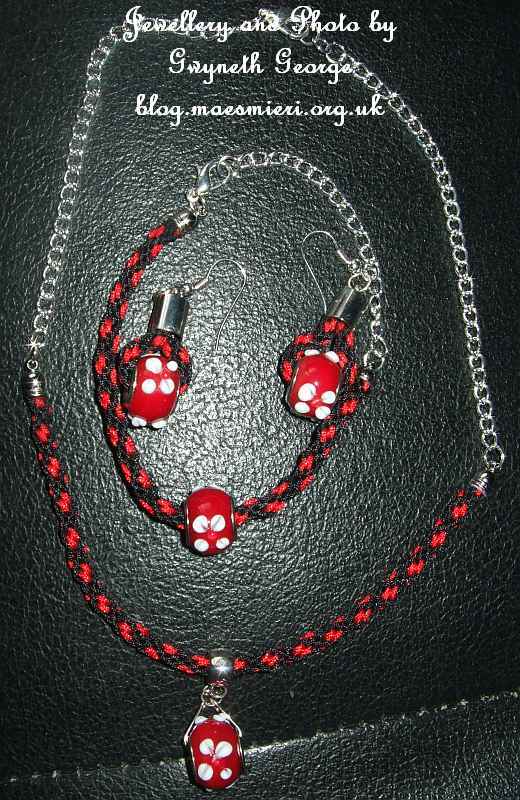 These, and a flower charm from my stash, were attached to the chain using jump rings. I have coloured in several digi-stamps over the last few days, but none of them are made up into cards yet, so you’ll have to wait until a future post to see what they turn out like. I’ve also had a few sewing and jewellery making projects on the go. Some of these are now finished so these are what I’ve got to show you today. I hope you like them. Please let me know what you think. 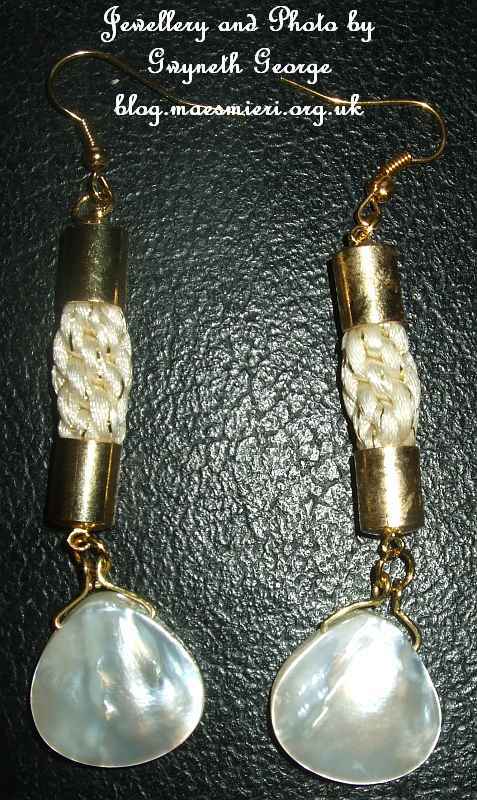 Back in my post of the 8th of May I showed you a pair of earrings that I’d made with a bead put on a piece of Kumihimo. 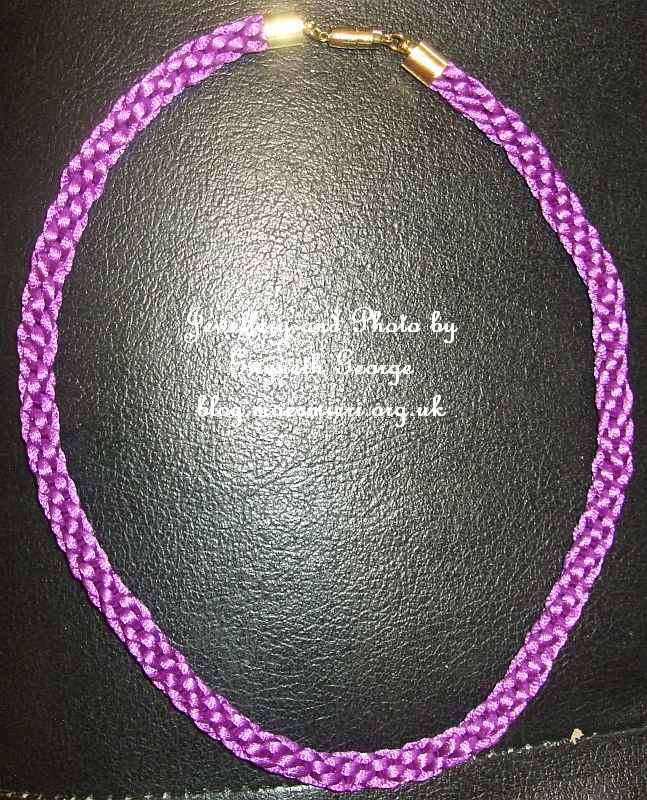 At the time I’d made enough Kumihimo braid to put onto a bracelet and necklace as well, but I didn’t have the right size end-caps to complete them all. 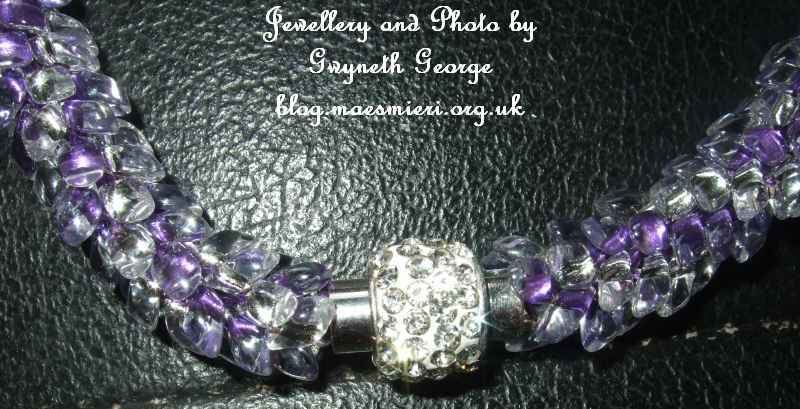 Well I’ve now bought in the pieces I require and finished making up the set of jewellery. I use some silver plated chain in the project because this means that I can adjust the length of each piece depending on what’s required by the warer. 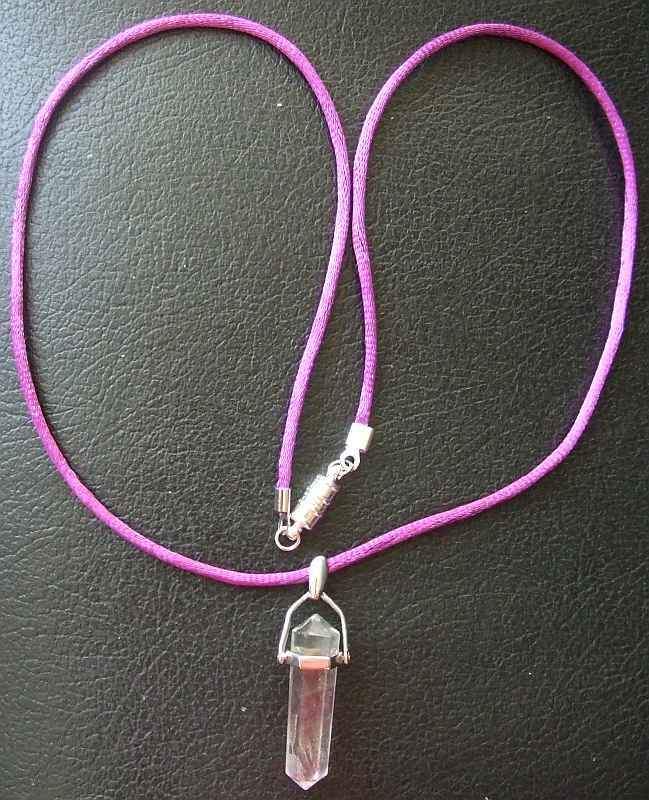 This next necklace was made in a similar way to the one I showed you in my post of the 6th of November, but this time I’ve used clear beads that are lined with silver or purple. 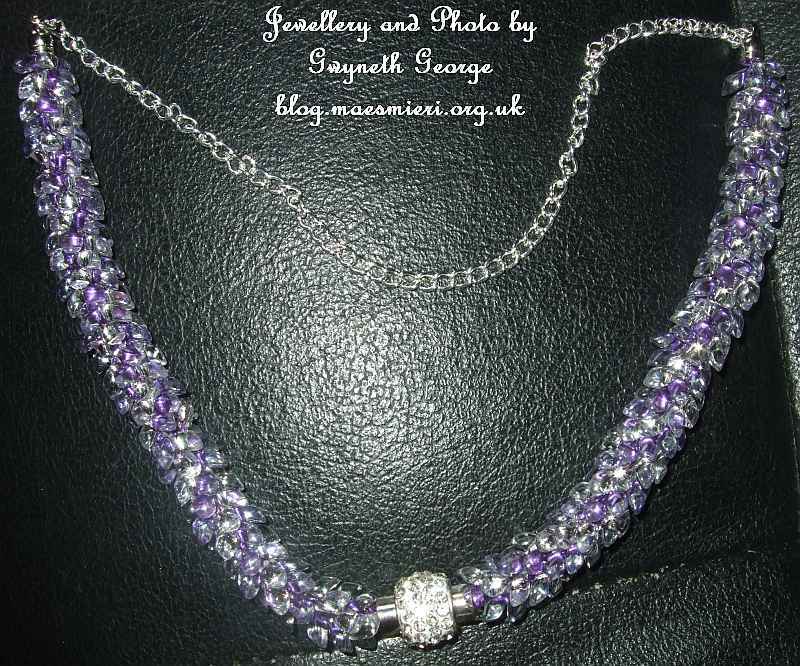 I’ve used Crystal Transparent silver lined and purple lined long magatama beads on this kumihimo necklace. 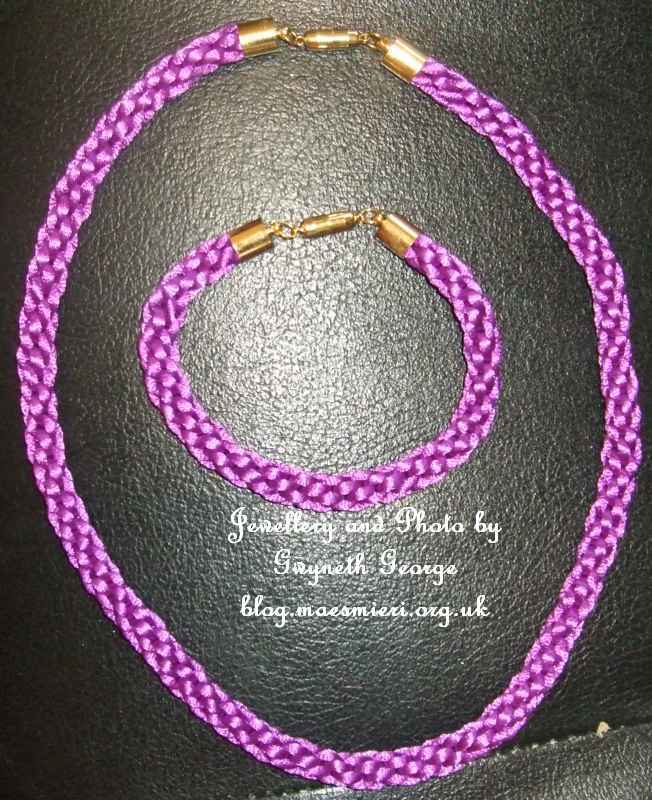 These were threaded onto purple S-lon cord for making this, one pack of each bead colour used for each side, so four packs in total were used for this. The back end of the cord is finished with bell shaped end caps. 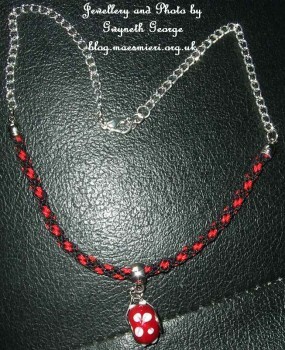 The back of the necklace is made of silver plated chain. 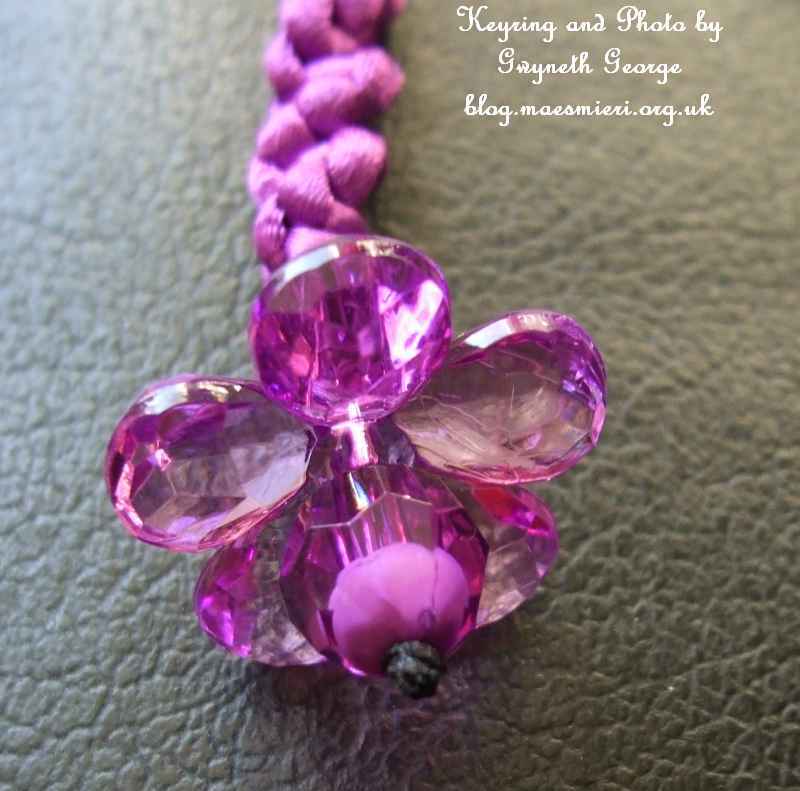 By using a chain at the back I can adjust the length of the necklace, by shortening or adding to the chain, to suite the warer. The central glitterball detail at the front. 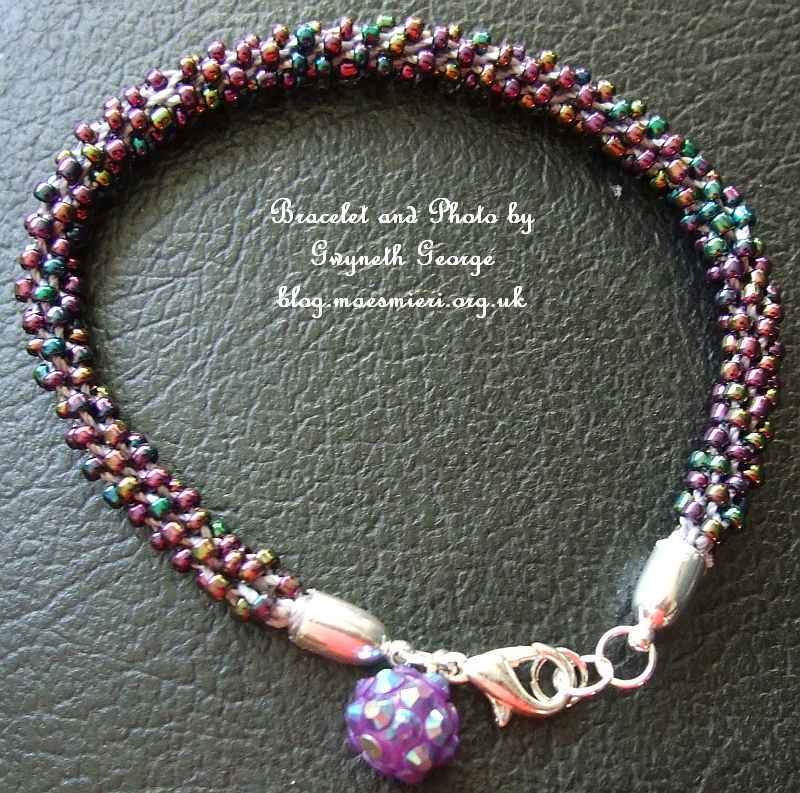 The glitterball is actually a magnetic clasp, so this necklace attaches at the front making it easier for those with dexterity problems to ware. 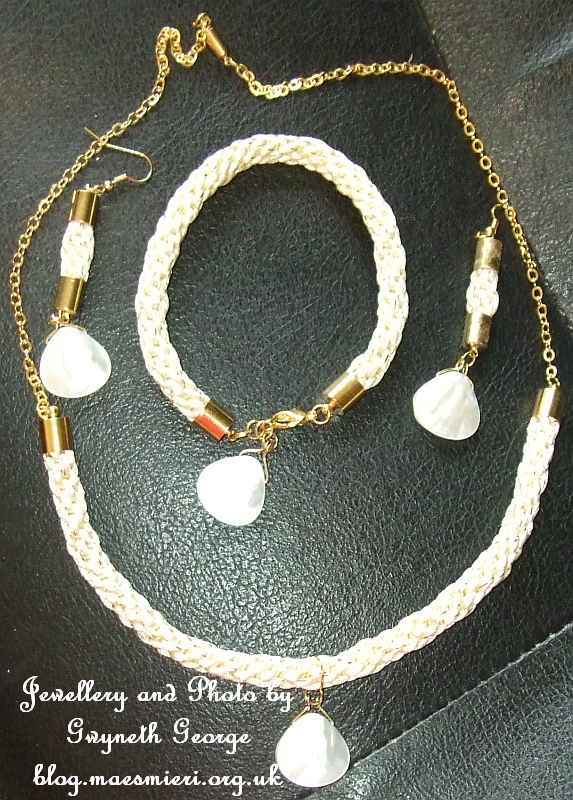 This set of kumihimo jewellery is made using a cream and gold satin rattail cord. I worked it all as one piece and then used thread wound around and tied either side of where I wanted to cut. The cut ends were then stuck inside gold end caps using Zap glue. 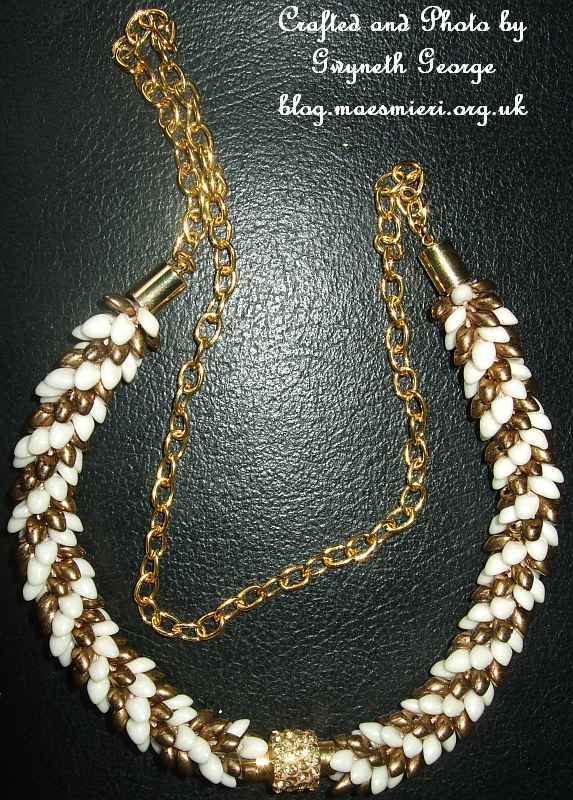 Shell beads from my crafting stash were added to each piece. Closeup of front of necklace. 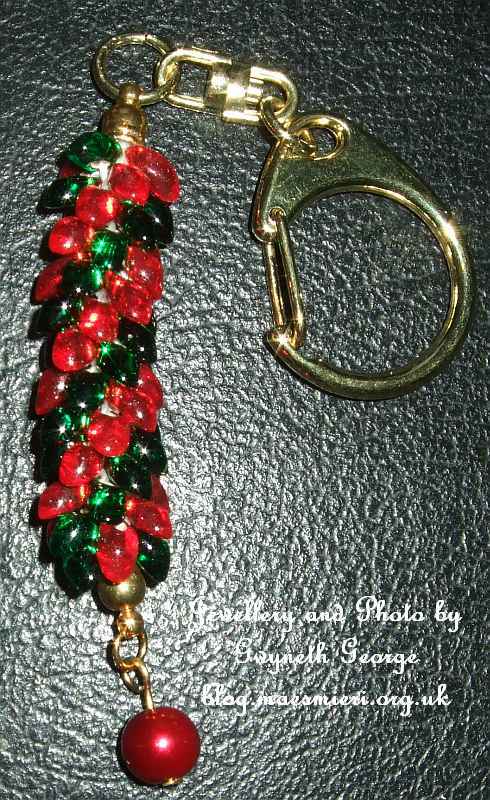 I used black rattail cord for the kumihimo piece on this keyring. One of the little items I’ve made to put into crackers. In my post of the 13th November I showed you a little cushion cover that one of my young nephews had made with some help from me. He’s now made, and stuffed with soft toy filling, a cushion to put in the cover (note to self – need to order some more micro-stitch strips as he used a whole strip to tack the sides of the cushion before he stitched it together with my machine). He also bought over his favourite quilt that he’s had since he was very young and is looking very worse for ware. It’s been patched by various family members, but now some of the edges were looking a bit frayed – so Saturday afternoon he sat at my sewing machine and used the blanket stitch to go all round his quilt, with me just sitting to the side to help hold the weight and turn the corners. 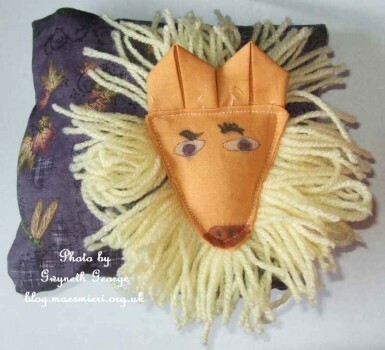 He raided my materials bag to find what he wanted for the main cushion cover and what he wanted for the lion’s face. The same shape as used for petals on his brother’s creation were used for ears on the lion (I’ve just spotted that a few of the white micro-stitch tacks he put in haven’t been taken out before taking this photo). 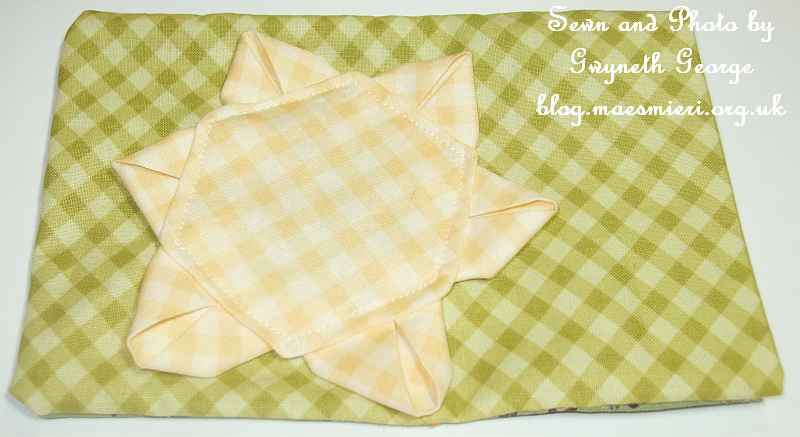 The face was made using a triangular template, but we sewed a bit round the pointed end. It was then stuffed a bit before attaching to the front of the cushion front. The nephew wound lots of yarn from my knitting stash around his fingers in bunches to make the lion’s mane, which we stuck behind the lion’s face before stitching it in place. I did the stitching round the lion’s face, but the nephew stitched the sides. 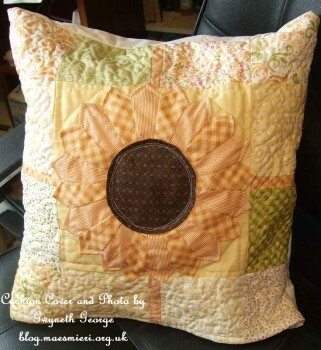 He also sewed and stuffed a cushion to put inside this cushion cover. It will be quilts for both soft toys before long I’m sure. This is a project I made myself. It’s the first finished of several I’m working on. Some are going to be Christmas or housewarming gifts. A couple of years ago I won a large assortment of patchwork material packs, so the cushions are going to be all different but several will be made using materials from the same packs so will co-ordinate. 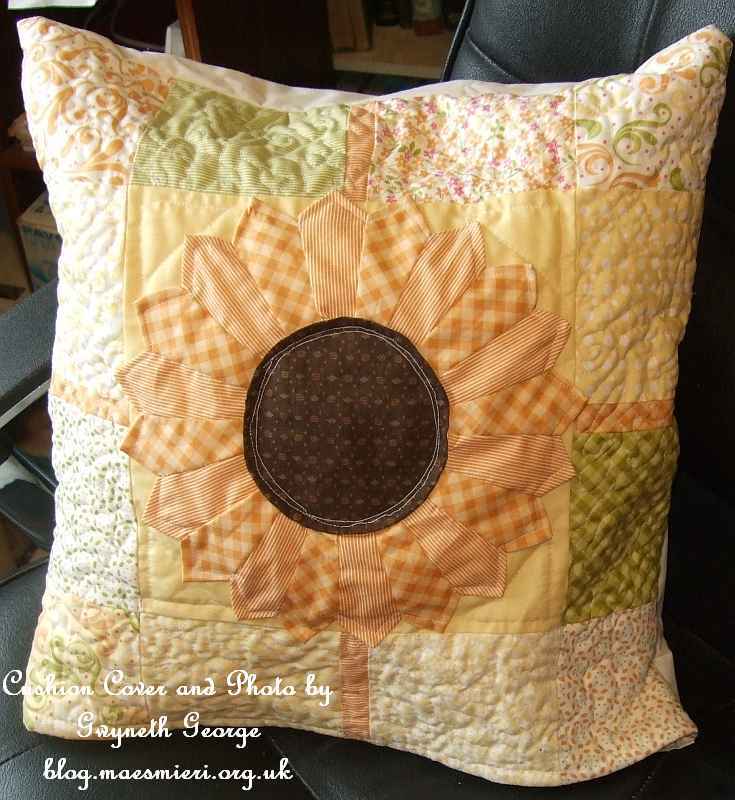 The central panel is decorated using a sunflower made using a dresden plate template and the outide border of squares is quilted in a free-motion wavy pattern. 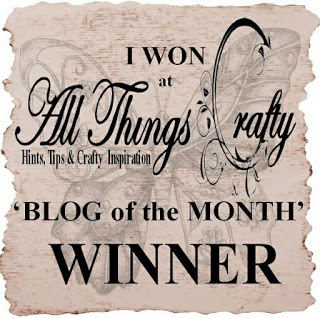 Now some of you who are regulars to my blog may well be asking yourself – how come I’m doing a Guest Blogger Showcase spot on “The Dragons Den” when you’ve seen me posting three times as a Design Team Member, as well as doing a pictorial tutorial, on the same blog? I’ve been a crafter of one sort or another for most of my life (a variety of crafts not just cardmaking), but being forced to take early retirement because ill health and disabilities some three years ago meant I could give more time to my crafting, plan ahead, and have fun and relax making things, rather than have to rush projects because they were needed when work, and other considerations, had got in the way. Not being able to work also meant that I had more time, (though quite often not the health or energy,) to sit in bed with my laptop and browse around, and get involved in crafting forums and groups on the Internet. 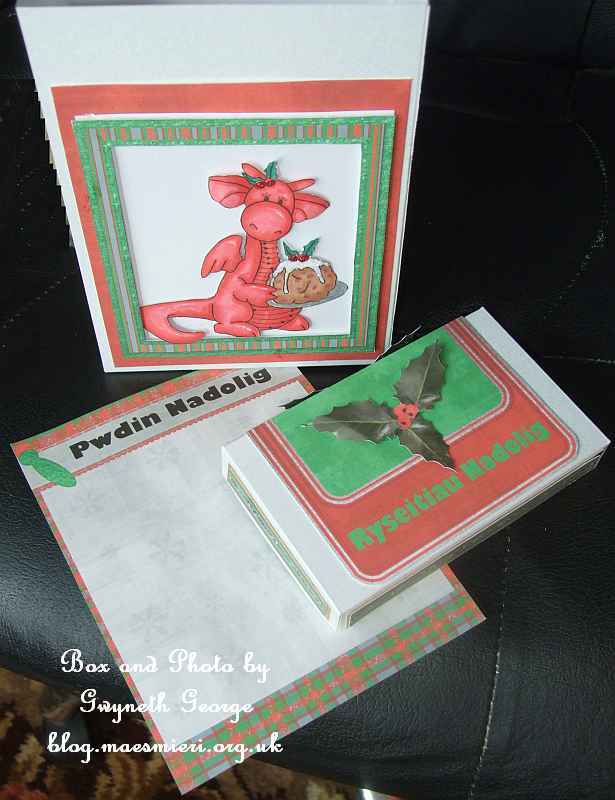 I joined the Stamping Dragon Designs Facebook group around 9 months ago – because I’d come across Janette Padley’s lovely dragons, (and other digital downloadable items) on craftsUprint and then found out that there was this group on FB for dragon fans. 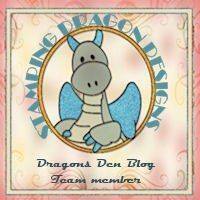 A short while after I’d joined, all the FB group members were asked if they would like to do a one off, Guest Blogger, showcase on The Dragons Den, a blog, like the FB group, dedicated to all things Stamping Dragon Designs. After thinking for a bit, and considering whether it would be something I’d be able to commit to and be able to see through to completion (I never know from one hour to the next how I’ll be feeling, and have had periods of months at a time when I’m too ill to do more than the basics of living) I decided to put my name forward – after all, it was going to be far ahead in the future, and I could start working on it way before the date. 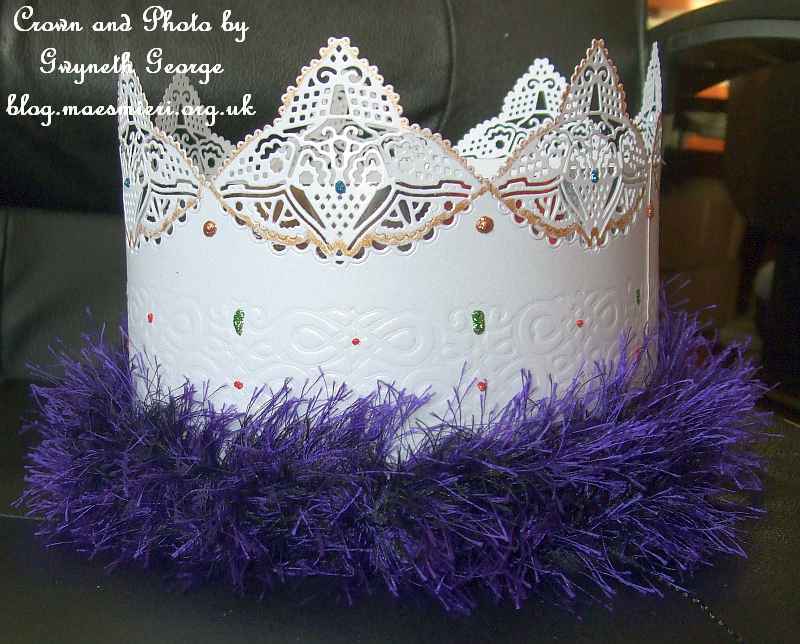 I was given this mid-November Guest Blogger slot! – and so I started thinking about what to do as a project for the blog with lots of ideas flitting through my mind – although I have to admit that it was only some six weeks ago that it actually clicked with me exactly how I was going to make my creation. 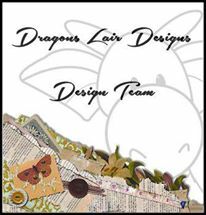 A few months ago, I was approached by Marleen and asked if I would consider becoming a regular member of a small Design Team on The Dragons Den blog. For the reasons mentioned above I was rather reticent to do this – but after some persuasion (Marleen is very good at persuasion LOL – she explained that I would only need to post every few weeks, could take my pick of digi-stamps from a list provided to work with so could pick things that inspired me, and could prepare several projects and posts ahead of time, when feeling reasonable, so that if I was having a bad spell I wouldn’t need to stress about not being up to doing a project and post) – I found myself agreeing. So there you have it – I was scheduled to do a Guest Blogger Showcase posting on The Dragons Den before I was approached to become a Design Team Member doing my regular “Pick of the Week” postings, and rather than shuffle everybody’s slots around it was decided that we’d stick to the original “Guest” schedule and I’d take the opportunity to tell you a little bit about myself. 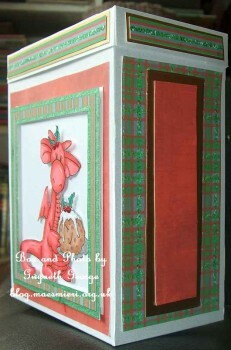 For my projects for this post I decided to make a “Christmas Recipies” box and matching Christmas card. 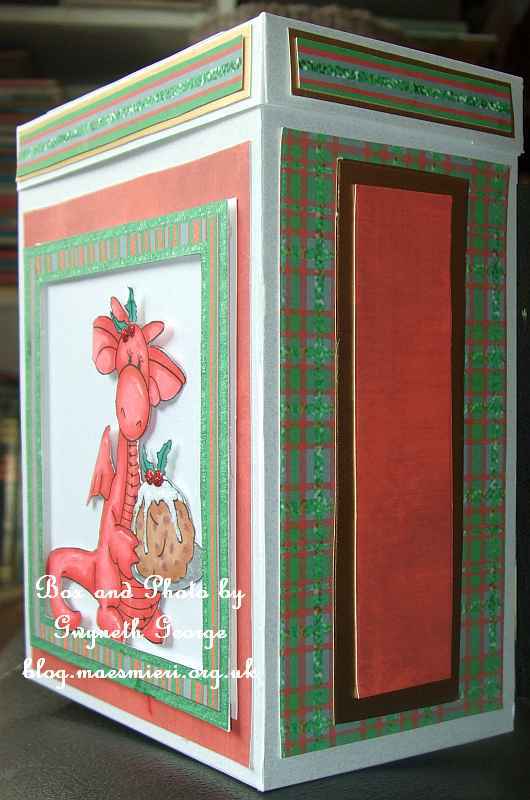 The box has cards inside for writing out favourite Christmas recipies on one side and putting photos on the other – though I haven’t done this yet. Thumbnail photos of some different areas/angles of this card can be seen below. Have a closer look by clicking on the thumbnails below. A view of the top. “Rysetiau Nadolig” means “Christmas Recepies”. 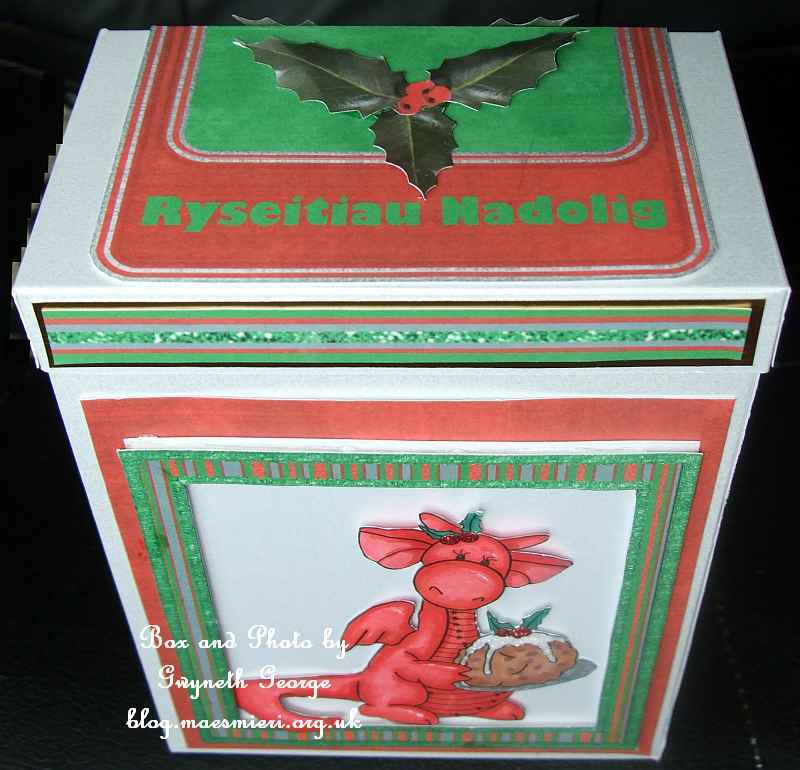 Box open with one of the cards for “Pwdin Nadolig” (meaning “Christmas Pudding”) pulled out. After printing everything out, and colouring in the digi-stamp, I cut out and then matted and layered the pieces. I used a Perfect Layers ruler to get an even small border. I stuck everything together with a variety of sticky mediums to give different dimensions. 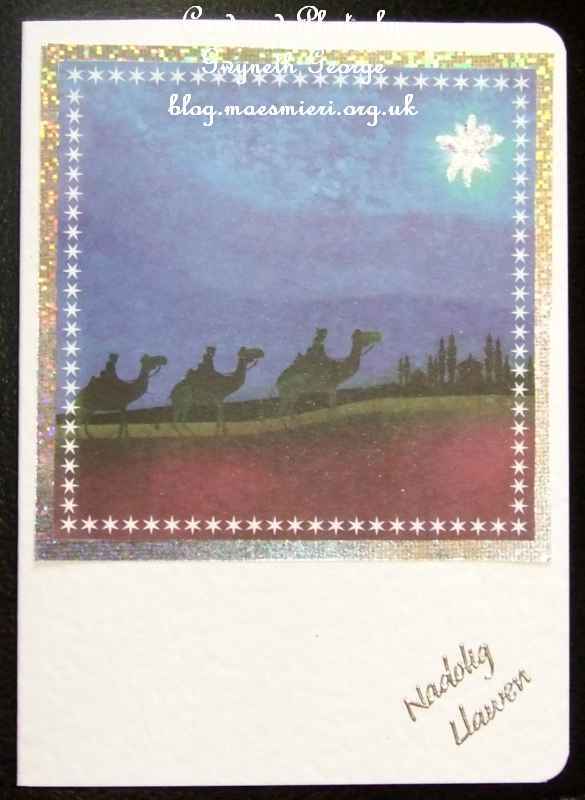 Some glitter glue was added for a twinkle, and a peel-off greeting “Nadolig Llawen” – which is Welsh for “Happy Christmas” was also added. 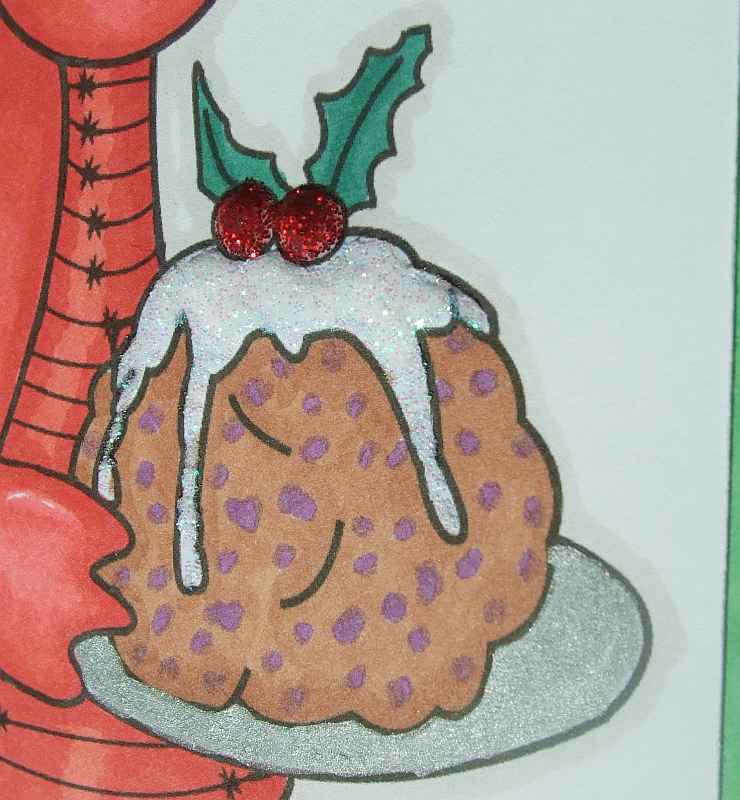 Closer look at the pudding with the white glitter glue over the sauce and red over the holly berries. 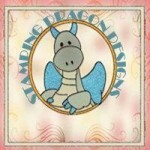 The Dragon’s Den – Blog : a showcase blog for lots of different crafting made using Dragon Designs. Those of you who have been to my blog a few times will have noticed that, every now and then, I’ll add a touch of metallic marker colour to some of my projects. The metallic markers I tend to use all the time now are the Letraset ones, and I’ve noticed that Letraset currently have a special offer on sets of these markers at the moment. So if you are on the look out for metallic markers now may be a good time to check out what they’ve got on offer. Regulars to my blog will also know that one of my favourite crafting equipment is my Silhouette Cameo digital/electronic cutting machine. I just wish I had the space to leave it out all the time and be able to just cut out designs whenever I feel like it, but space is limited, and my health problems mean I can’t take it out to work with and then pack it away as often as I’d like. What you may not realise is that Letraset are also suppliers of Silhouette products and currently have offers on several Silhouette products, including the Cameo and Portrait, as well as some of their Starter Kits. If you are on the lookout for some Silhouette stuff you may want to visit the Letraset site to compare the prices with other sites you are looking at. I’ve finished making the patchwork and quilted cushion cover I was working on last week, but my youngest nephews were here after school today so I’ve not had time to tidy it up and photograph it yet. Hopefully you’ll see it in my next blog post. What I did get roped into doing was a cushion cover for a little cushion for one nephew’s teddy. So out came my bags of quilting cake layers and templates for him to choose his material and template. Then came a lesson on safely using my Microstitch tool to tack pieces together before I sewed them in place, although he wasn’t allowed near my rottery cutter – observation only during the cutting. After the decoration was on I even allowed him to sew the outside seams on my sewing machine under strict supervision after a lecture on how sharp the needle was and how it was a big person’s machine, though he did have to have the foot pedal up on the step, that him and his brother use to stand on to wash by the sink in the bathroom, as he isn’t quite tall enough to opperate the foot pedal on the floor yet. He was so excited to have the chance to sew anything at all that he didn’t put a finger wrong. The same nephew has also ordered a Welsh scarf for the same teddy – in other words one with red, white and green stripes and a dragon stitched on either end – not a chance, but I do have a ribbon with the Welsh flag on it that I can cut a bit and attach to the ends of the scarf – so another thing to keep an eye out for. 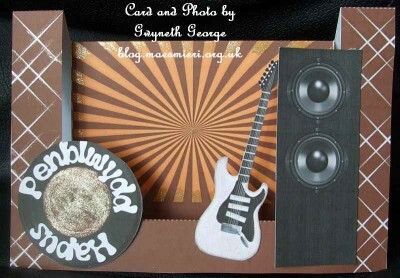 And just in case you are wondering – I have made some cards and some bits of jewellery – so there are some crafting pictures, not just text, in this post. I hope you like them. I’ve just realised that there’s only just over six weeks left until Christmas. I think I need to step up my making of Christmas gifts and Christmas cards, and also ordering the gifts I can’t make myself. I want to make a little something for everybody, even those who won’t get a hand made main gift. One thing I did do today was order some wrapping paper. Not patterned paper though. I’ll either stamp or stick on some little toppers to decorate for the youngsters. 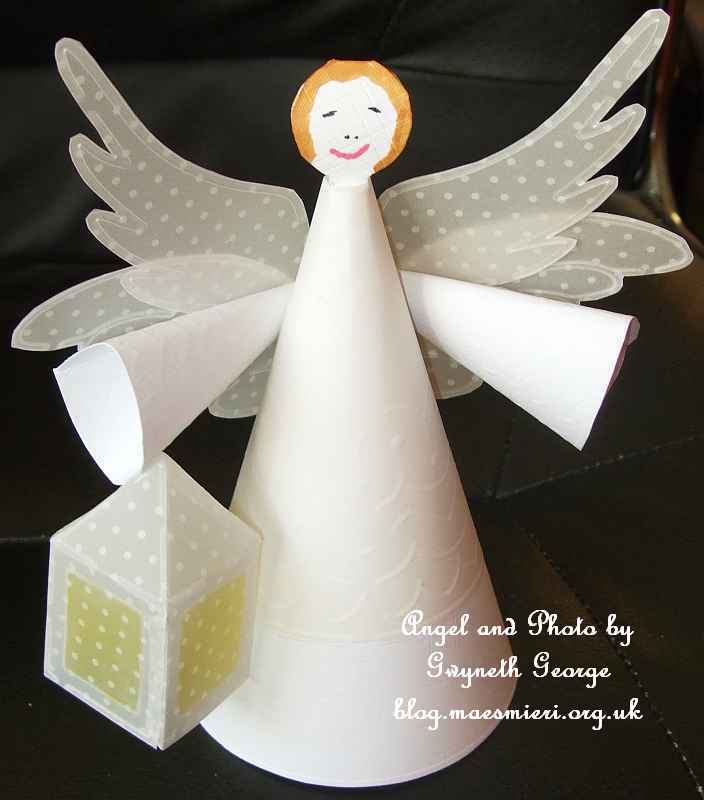 I do tend to buy plain paper for wrapping for Christmas as it then means that any spare can be used for birthdays, especially for gifts for family members who have birthdays at the start of the new year. When the wrapping arrives I’ll be able to start packing Christmas gifts as they are finished or delivered. At least that way they’ll be kept clean and tidy and stored safely until Christmas. I don’t know if anybody else is like me, but I tend to have a lot of ideas of all the things I’d like to try making, and then the reality of what is realistically possible steps in, especially when I realise how few a number of weeks there is to make everything. So I’ve now started trying to prioritizing what must be done, what I’d really like to get done, and at the end the stuff that it would be nice if I got done but isn’t critical. 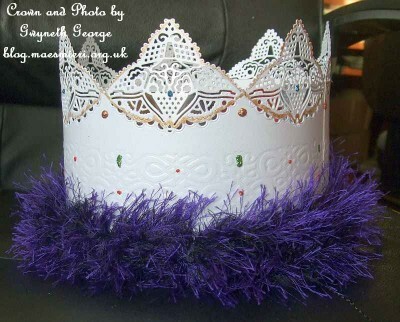 After all – there will be birthday’s again next year and anything I want to make for somebody – if it’s not done by Christmas I can give them for their birthdays. More Christmas cards are a must. Finishing off a couple of sewing projects is a must. Some little jewellery projects such as keyrings, bag charms, etc., are a must as they can be the little hand made thing for everybody I’ve not made a larger handcrafted item for. etc., etc., And now my must list is growing to longer than I’ll comfortably be able to do if I have an average few weeks for me. Of course, if I have a bad few weeks it all goes out the door and I’ll have to order gifts for most of the family – I just need to have a think about what to get everybody now so that I don’t have to stress out if I do have to switch plans. Does anybody else other than me make a second plan in case they are not well enough to see the first one through before mid December? I’ve just got to wondering this week whether anybody else, especially anobody who have fluctuating health issues use some of the resting time to lie down and make different plans for the run up to Christmas to take into account how they’ll be feeling? I personally find I get less stressed and able to do more If I work this way. The back of the envelope in the previous photo. It has been months since I showed you my first piece of beaded Kumihimo – here – but at that time I hadn’t got end caps of the right size to make it into a piece of jewellery. Well – this has finally been completed! 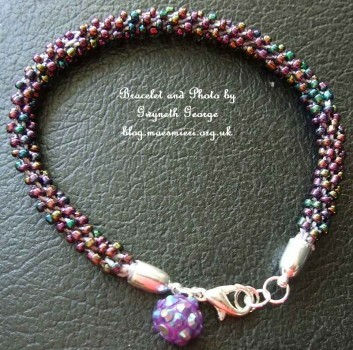 A beaded Kumihimo bracelet with a sparkly ball charm. Some little items I’ve made to put into home-made crackers. 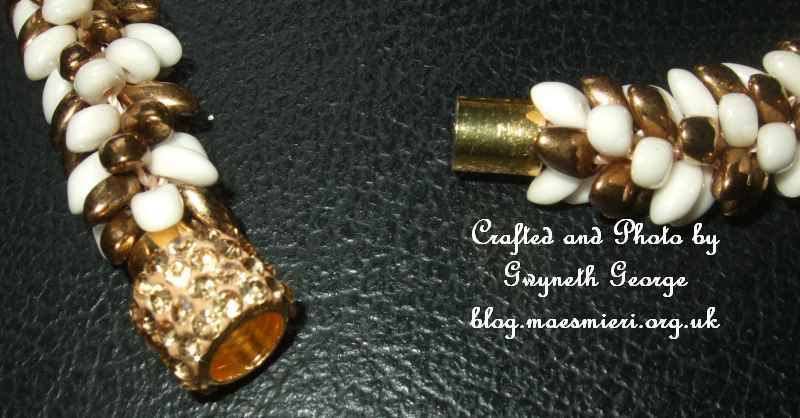 Those are yet to be made but I have got the dies and the snaps ready. 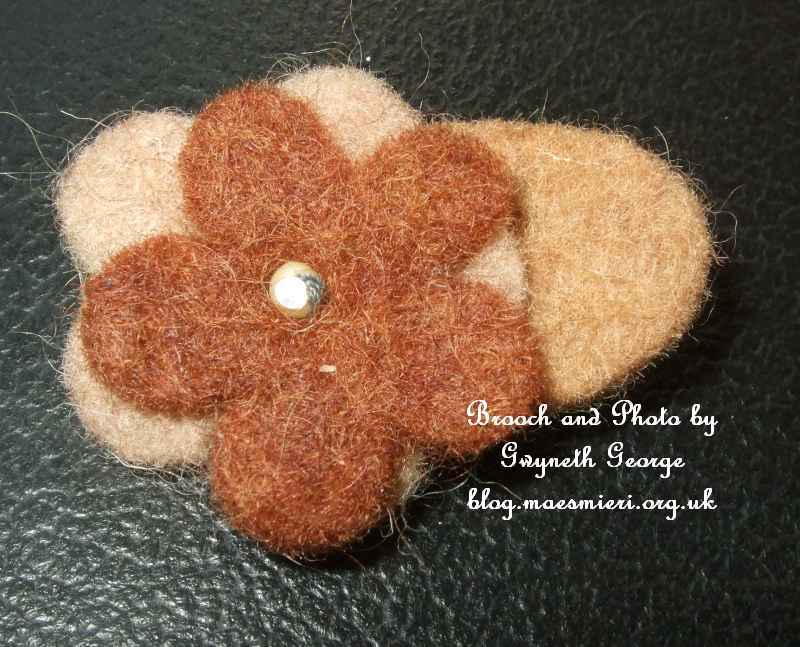 The front of a felt brooch made using elements from a “Felt Bead Assortment In Box Brown Shades” box. 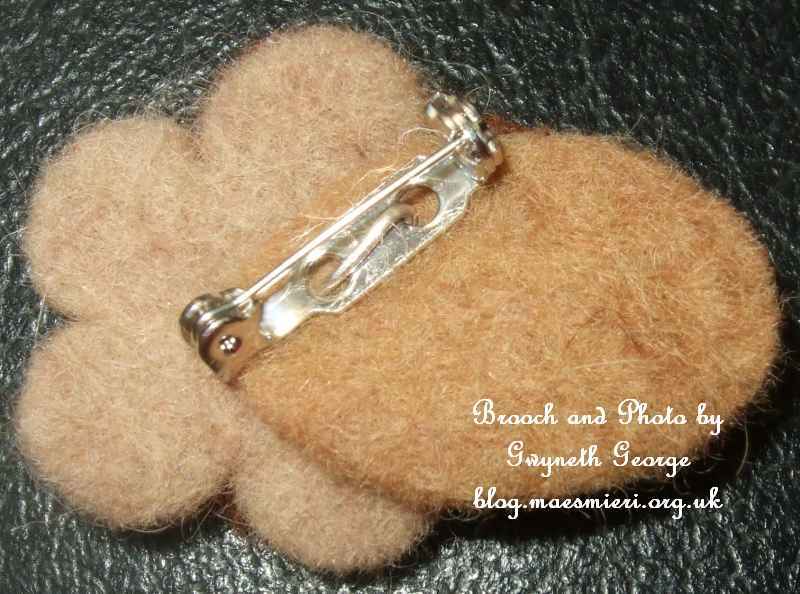 I put a head pin in from the front, pushed it through to the back and looped it through the back of a brooch pin finding. The back of this felt brooch showing the brooch pin attached. 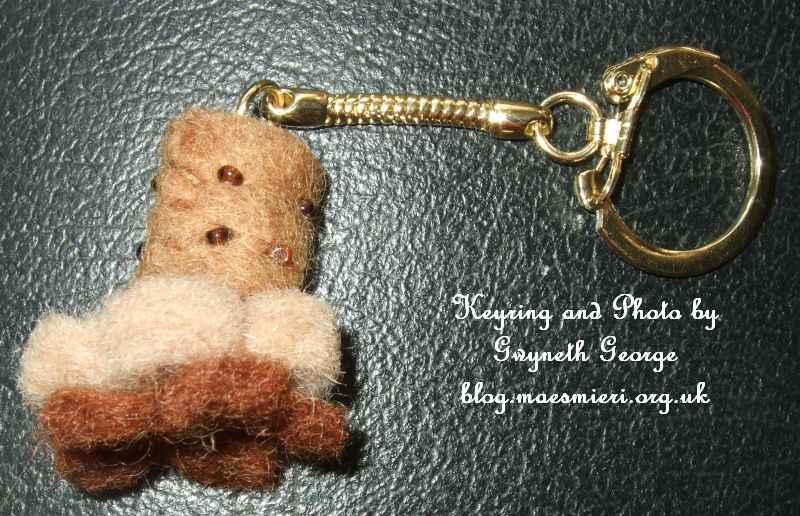 This keyring was made using elements from a “Felt Bead Assortment In Box Brown Shades” box. 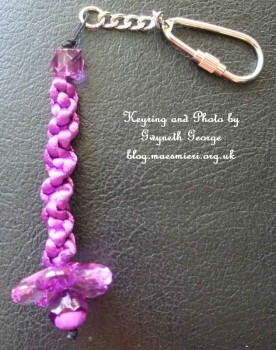 I put a head pin in from the front, pushed it through to the back and looped a loop to add to the keyring attachment. It could also be used as a bag charm. 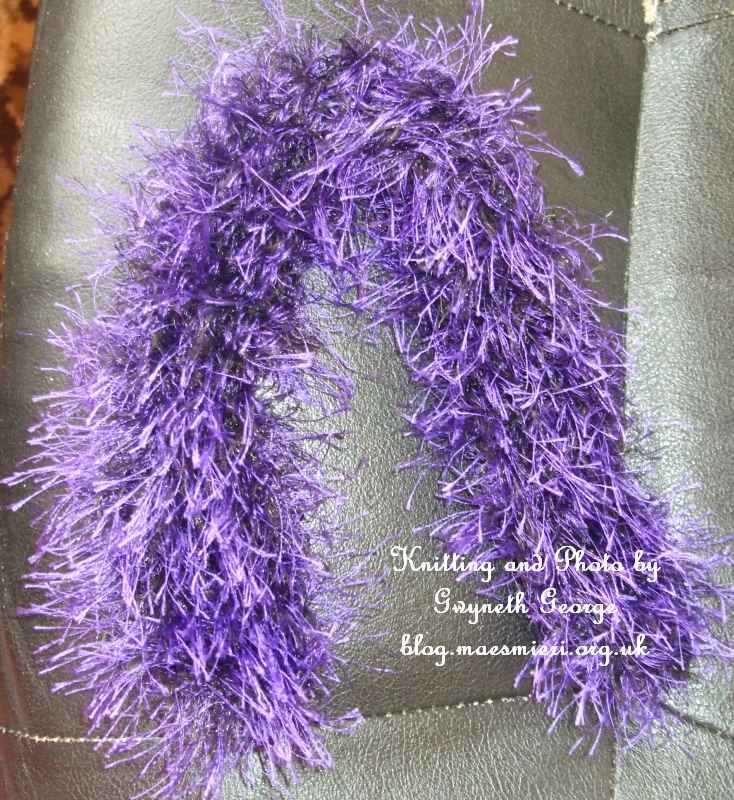 All these photos show the same felt fob keyring from different angles. Small cushion cover for a cushion for one of my nephew’s teddies – material and pattern choice made by nephew as both him and his teddy like green and yellow, as was tacking all the pieces into place using micro-stitch and sewing of back to front. I did sew on the pattern as I was a bit worried that the sewing through so many layers in some areas of the flower would cause the needle to snap – but I’m so impressed with my Brother sewing machine – there was barely a change in sound as it went through the material, which was up to 10 layers in some areas + a layer of sew in interfacing. From top to bottom of this picture the cushion cover is 5″ in size. The decoration was made using a hexagon cutting template, and the petals were made using 6 x 3″ squares of the same material that were folded. Wednesday, 6th November – Here! 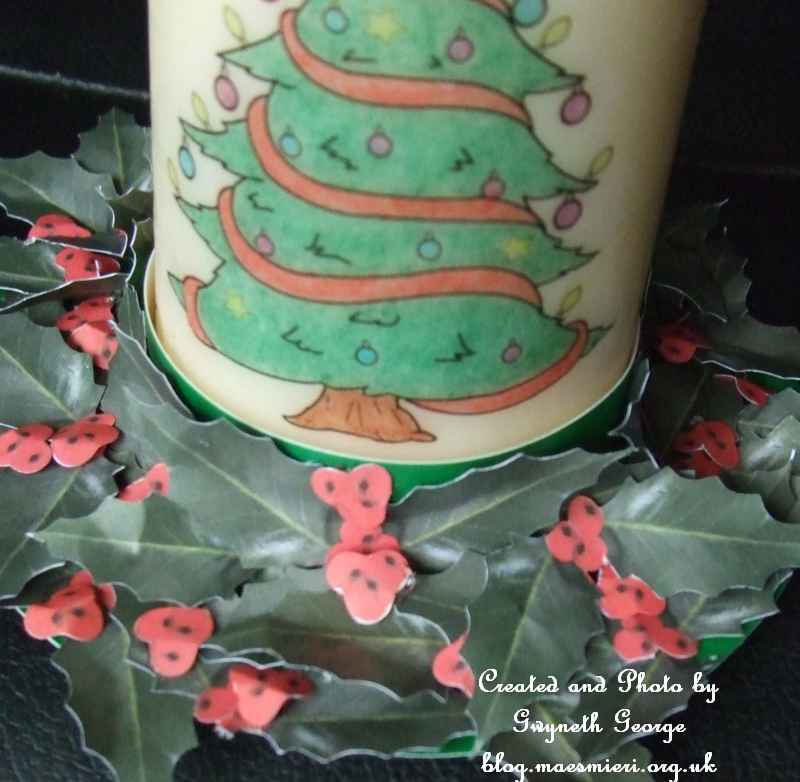 – FAST TRACK the Crafty Bob Stand at the NEC, CUP News & Craft Fuel! Friday, 8th November – Here! 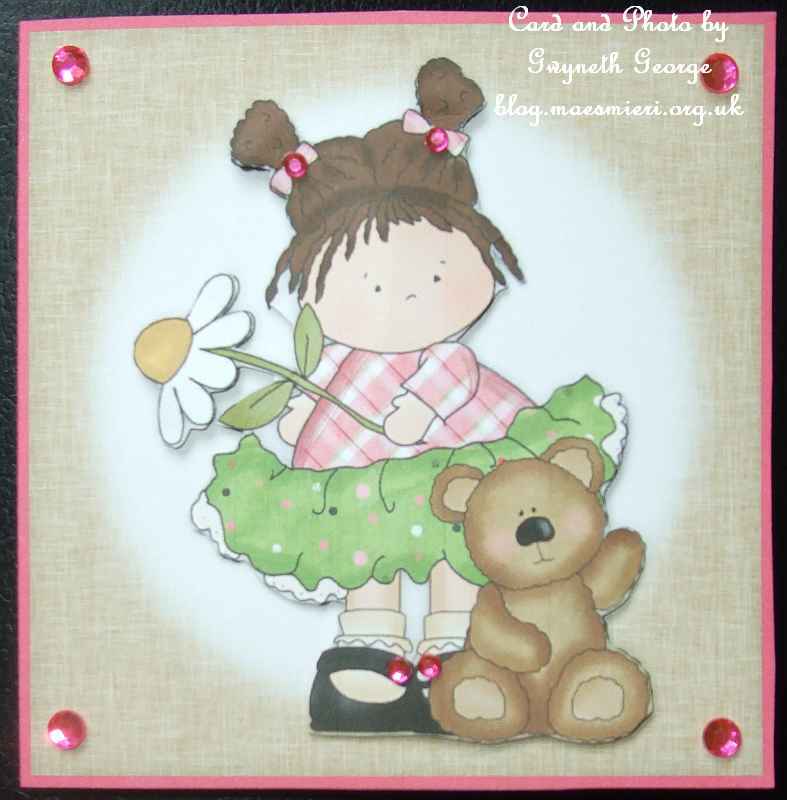 – Vol 71 FREE CD, HOT Designs, Crafty Bob Fast Track, 11 New Froms and a 1p Tool Set! Today I’ve had my sewing machine out doing a bit of patchwork for a cushion cover. It isn’t finished yet, so I can’t show it to you today, but keep an eye out over the next couple of weeks and you should see it appearing before long. What I have got to show you are some cards I finished the begining of the week, and a notebook that I’ve decorated quite simply. I’ve also finished off the necklace I started off last week. 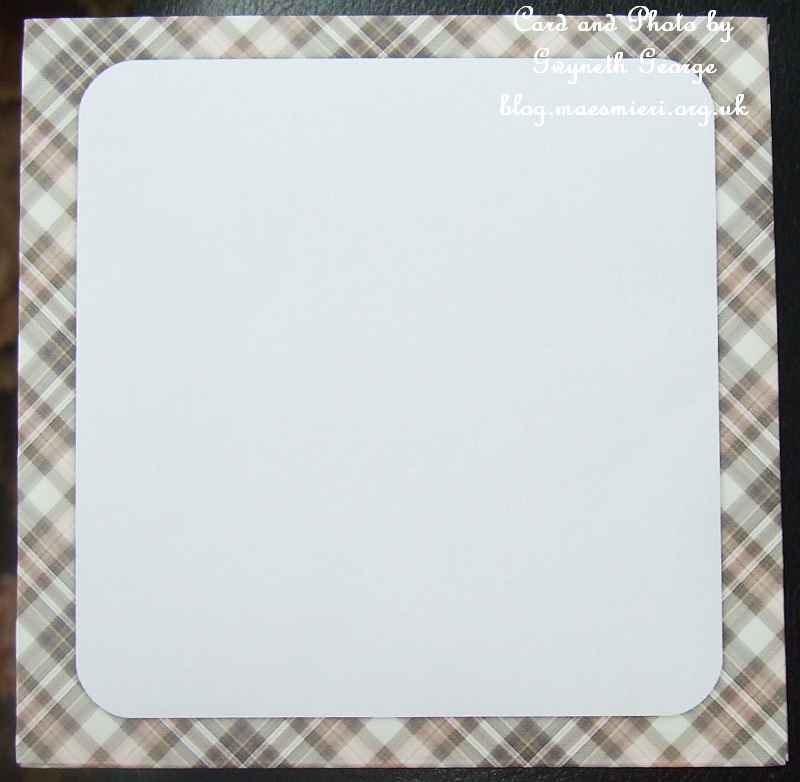 This first batch are little cards that will go through the post using a standard letter stamp. I’m slowly adding to my stash of crafted items ready for Christmas gifts. This is a simple covered notebook. 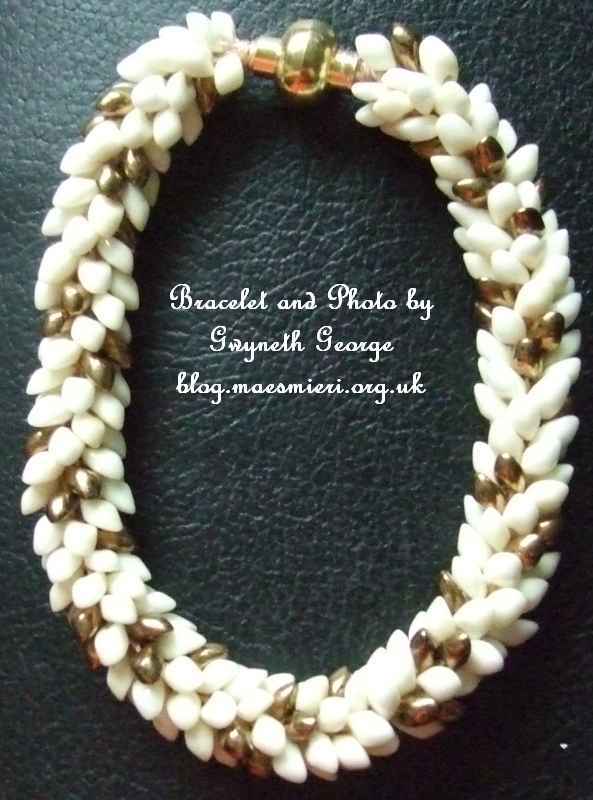 In a previous post – here – I showed you how I’d started making one side of a Kumihimo beaded necklace (made using just two different Long Magatama 4x7mm colours of beads – White Pearl Opaque and Bronze Opaque Metallic.). This is now finished. I hope you like it. The completed necklace. 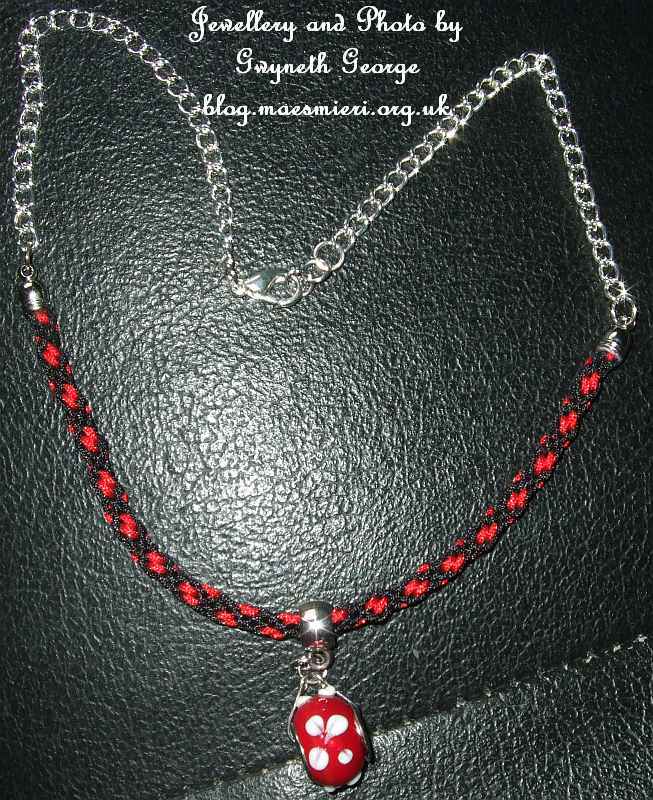 I’ve put quite a long piece of chain to finish the necklace and I can shorten this to suit the wearer’s preference. The central detail is actually a magnetic clasp. This means that there’s no fiddling behind the neck to clip a clasp for somebody who has dexterity problems, just loop it over the head and put together at the front. Time certainly does fly when you are having fun, and it’s already four weeks since my last “Pick of the Week” post for The Dragon’s Den blog. 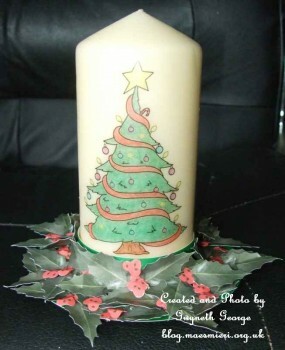 Today a new post went live on the blog with a card I’d made and candle I’d decorated showcasing more great digi-stamps. You can see the post – Here! Thumbnail photos of some areas/angles of both these can be seen below. The smaller card was scored 1cm into the back from the fold to give a dimensional “spine” to the card, and then the shortened back had a red card attached to make it the same size as the front. 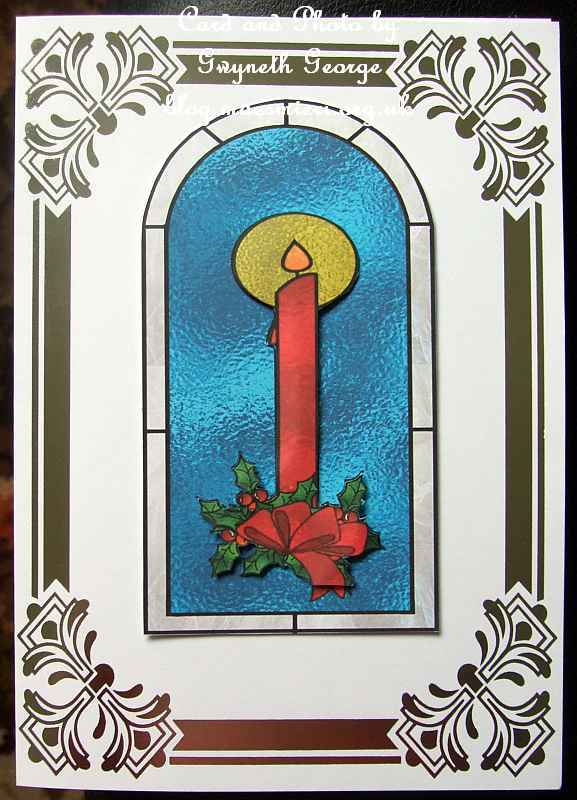 Windows were cut out of the front of the card and a sheet of acetate was attached to the back of the window, trapping a piece of red ribbon between window frame and acetate. This smaller card was matted and layered onto the larger card, again trapping a piece of red ribbon between the layers. I printed out the two digi-stamps out onto Super Smooth Cardstock, coloured them in using my ProMarkers and some other markers, before cutting them out. 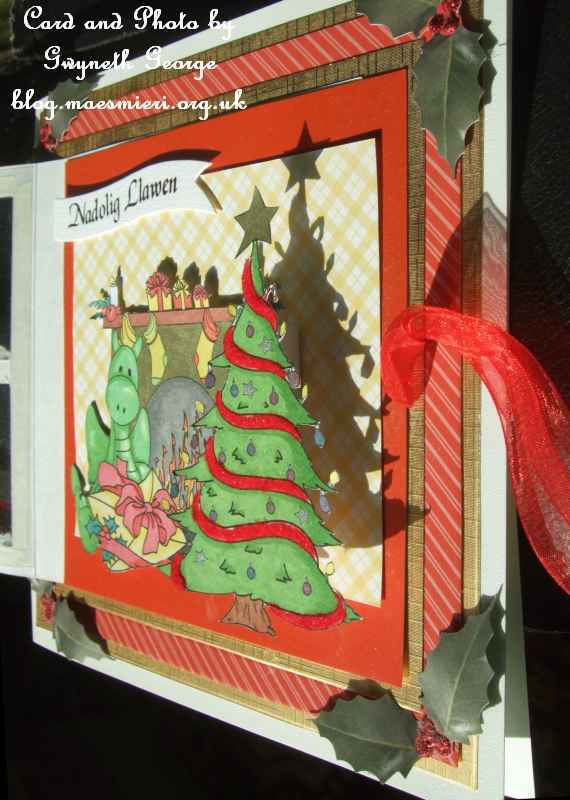 The yellow patterned panel was stuck inside the smaller card, and the digis attached, the fireplace image using foam tape and the tree using a “box” constructed of a strip of cardstock. Further decoration of die-cut holly leaves and glitter flocking was added to decorate the front and the two ribbon ends were tied in a bow. I attached a piece of printable tissue to a sheet of lightweight paper using finger-lift tape and printed the digi onto it at the right size for my project. I then coloured it in using my ProMarkers. 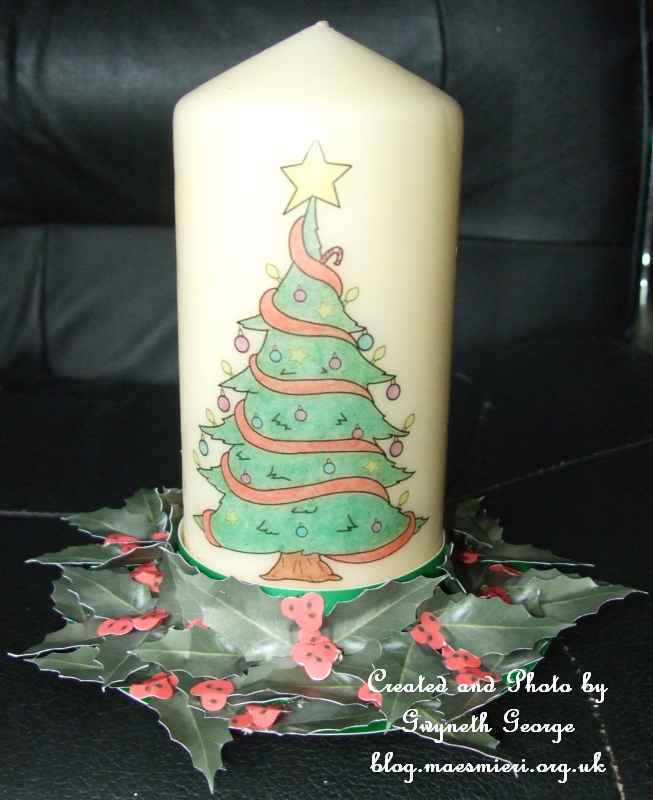 I tore around the edge of the tissue close to the image, put it onto a pillar candle, wrapped greaseproof paper around and heated with my heat gun until the wax began to melt. I then pealed the greaseproof paper off and gave the re-set wax a quick polishing rub with a tissue. 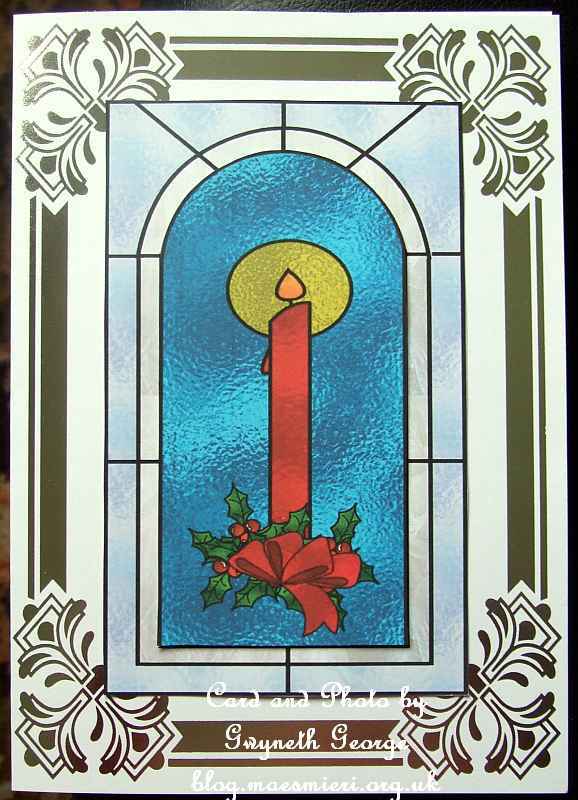 The holly wreath decorative base was made from a circle of Satin Board and a strip of Satin Board made into a collar and attached to the base. 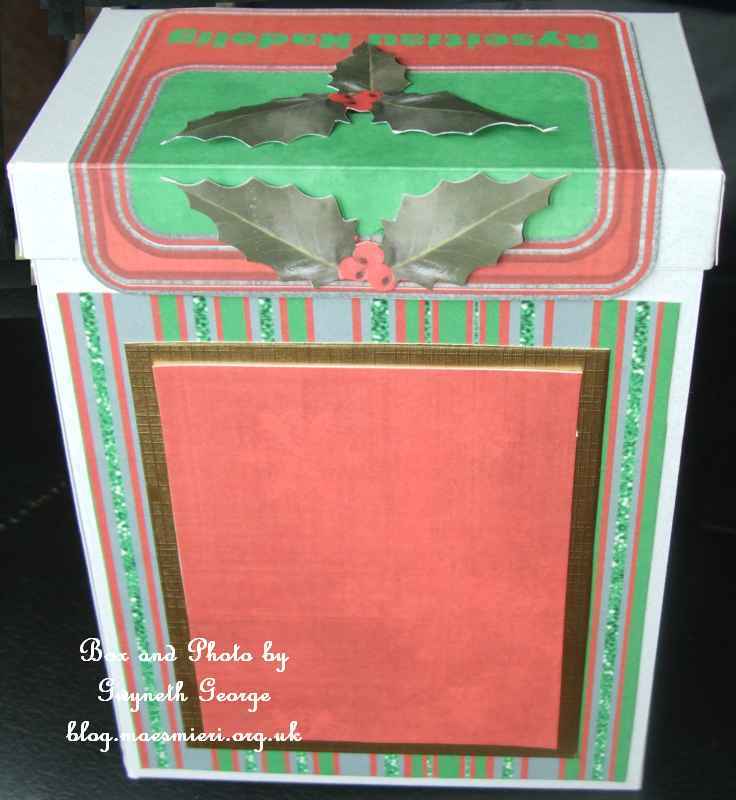 This was decorated using die-cut holly leaves and berries from my crafting stash. 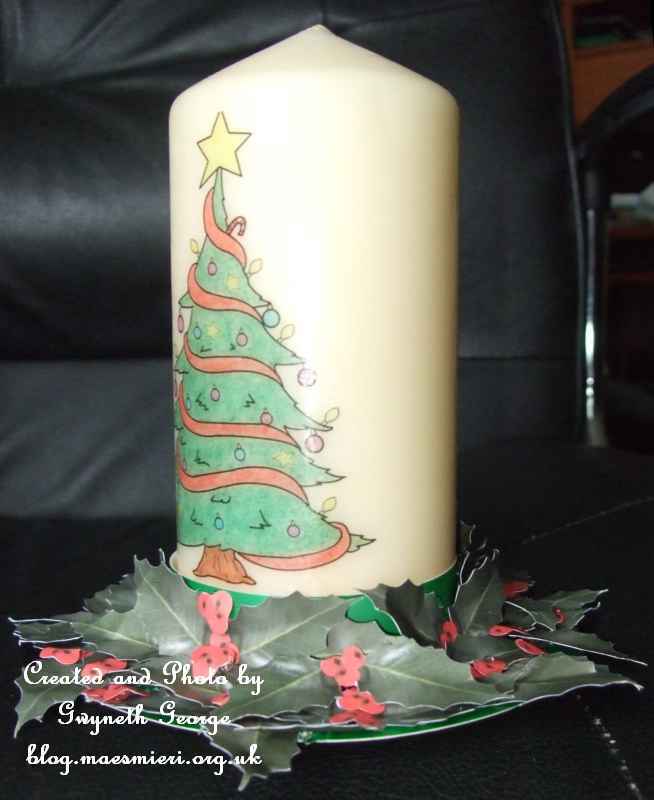 This candle can be burnt, but not on the holly wreath decorative base. “Oh Christmas Tree Coloured” – Here. “Jiggy in front of Fire” – Here. 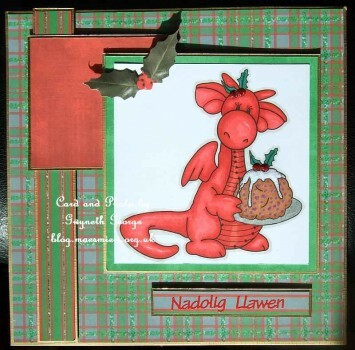 Keep an eye out for my next “Pick of the Week” post for “Thre Dragons Den” on the 2nd December – when I’m hopeing to show you another Christmas card, and in the meantime there will be further posts by the other design team members practically daily up to then to inspire you. If you don’t want to read my musings, or know what I used and how I made an item you can just click the thumbnail images to view each card at a larger size, and then click “Back” and scroll down to the next section. I’ve not done a lot of crafting the last few days, but what I have done has been quite varied. 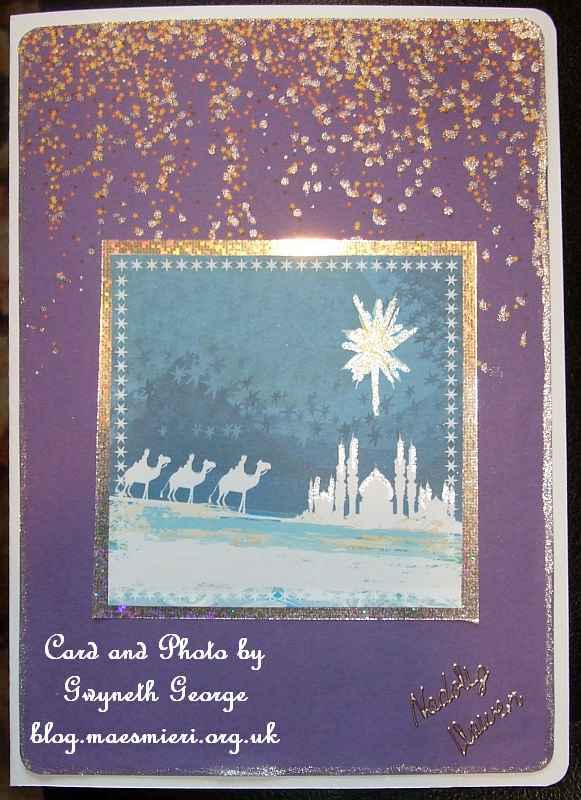 It’s time to step it up for making things for Christmas so you can expect more Christmas cards and gifts over the next few weeks. In the meantime I’ve just got a small number of items to show you today, so I hope you like them. I’ve also not done a lot of thinking over the last few days, but what I have been thinking about is Halloween and wondering how and why this has become so important to some people over the last few years in a totally different way to its roots? We certainly didn’t do anything for Halloween when we were young. I’m sure my sister’s children had been in school for a couple years before Halloween mania struck around here. 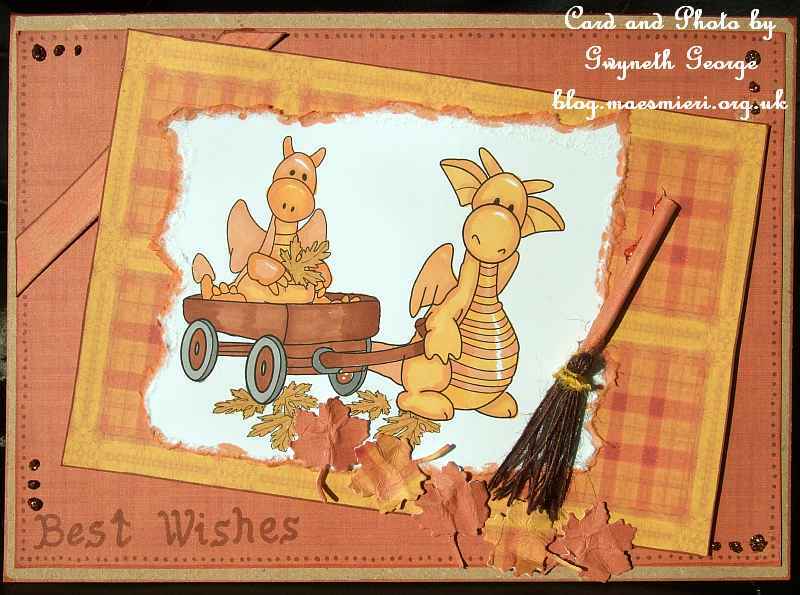 And as for Halloween cards – I hadn’t seen one of those until the last couple of years. 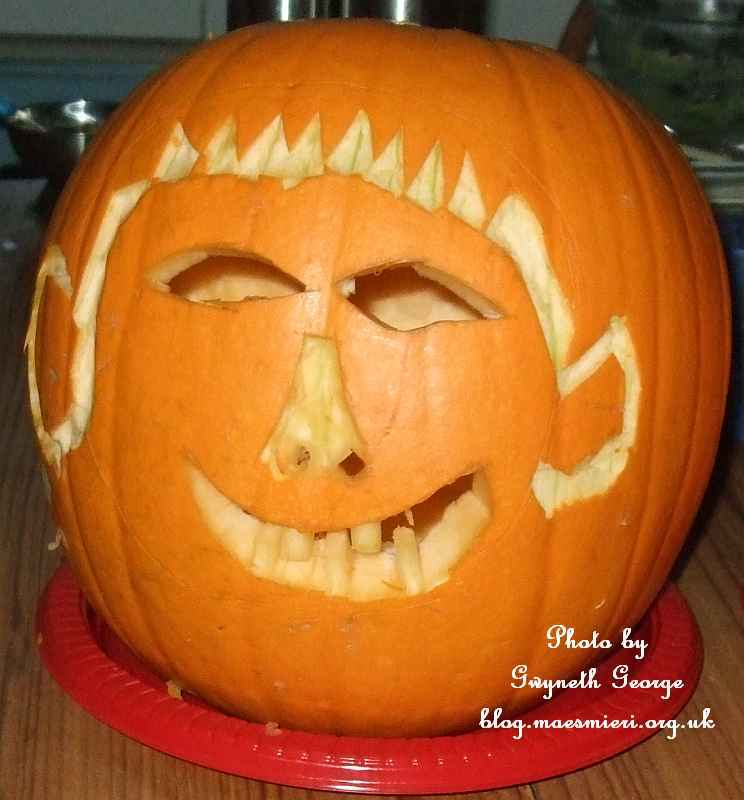 Of course, we now do something with a Halloween theme with my two younger nephews, so they don’t feel left out, and they get to do some pumpkin carving – but we take out at least half the fleshy layer to cook with, so we are not wasteing a perfectly good vegetable. I know that the word Halloween comes from the Christian title for the day – “All Hallows’ Eve”, being the day before All Hallows’ Day or All Saints Day. Traditionally the All Hallows’ Day is celebrated on the 1st November when the saintly people who have passed are remembered, with All Souls Day being on the 2nd November being a day when all the departed were remembered and prayed for. 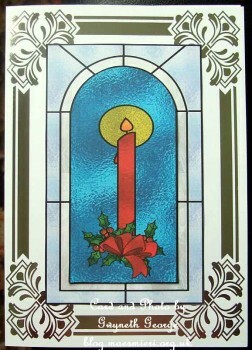 I know that these are celebrated more in some countries and churches than others, and celebrated in different ways. I also know that there’s some belief that these Christian events did borrow from elements in pre-Christian societies where the end of summer and getting all the crops in, together with a preparation for the changes and “death” in the land as winter comes, but by now Halloween appears to me to be totally comerciallised with companies making millions on Halloween dress up clothes, Halloween themed chocolates, etc.. As if – in these times of recession – parents don’t already have enough pressures on them and their limited money! Of course, while working on the nephews pumpkins with them, I started to wonder about what all the people I’d met online, from all over the world, did for Halloween, if anything? 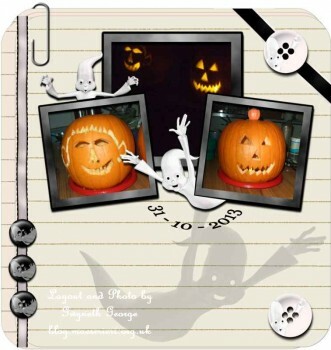 And if they did celebrate Halloween – what meaning did it have for them? 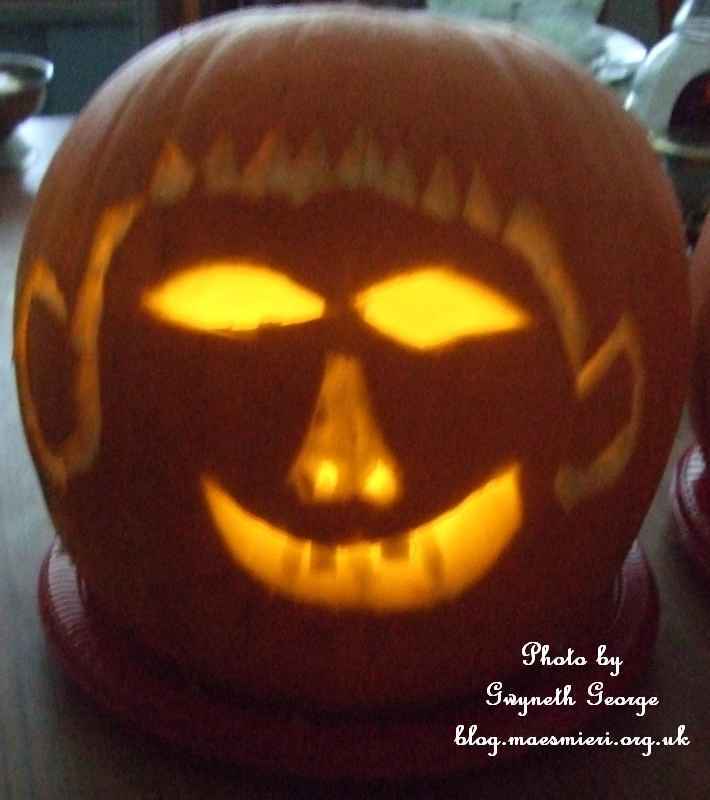 Please feel free to leave a comment with your take on the festivities in the box at the end of this post, I’d love to hear about Halloween in different parts of the UK and around the world. The first item I’ve got to show you today is a sympathy card. I wanted a touch of colour on it but didn’t want to go bright, so I went for an egg-yolk yellow with the white. 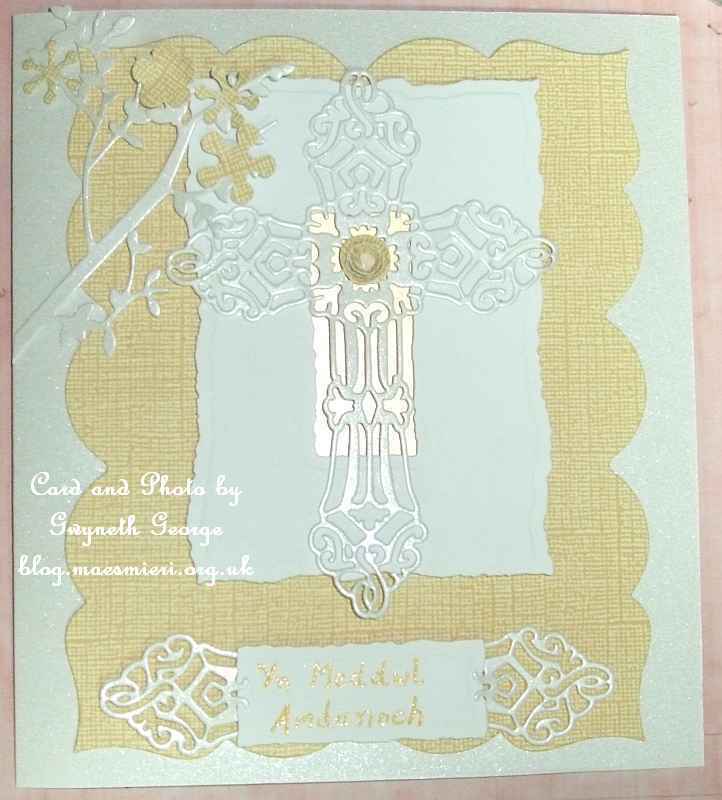 The topper cross, branch and flowers were cut using Tattered Lace dies in my Joy machine. 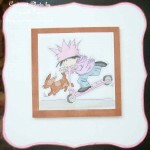 I used Centura Pearl cardstock for these and the base card. 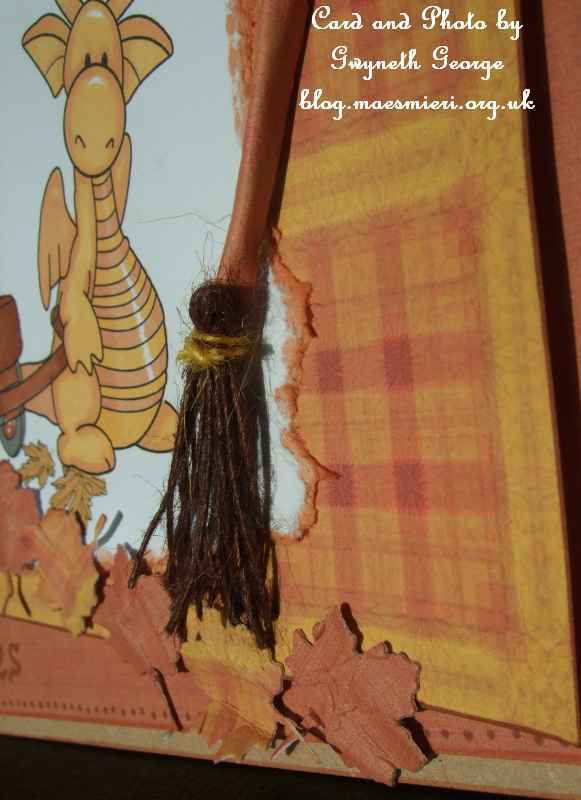 I also used a yolk yellow, linen textured, cardstock for one of the mats and some of the flowers. 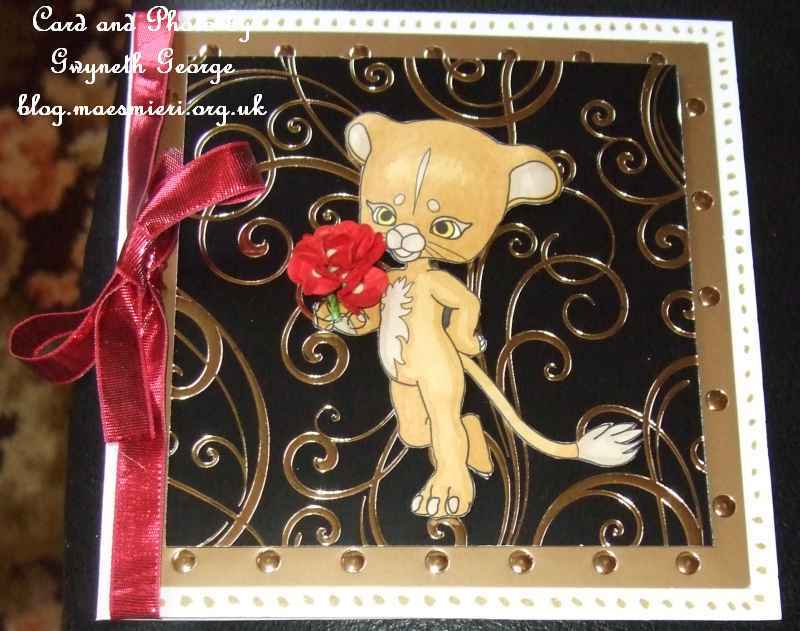 The mats were cut out using Spellbinders dies. 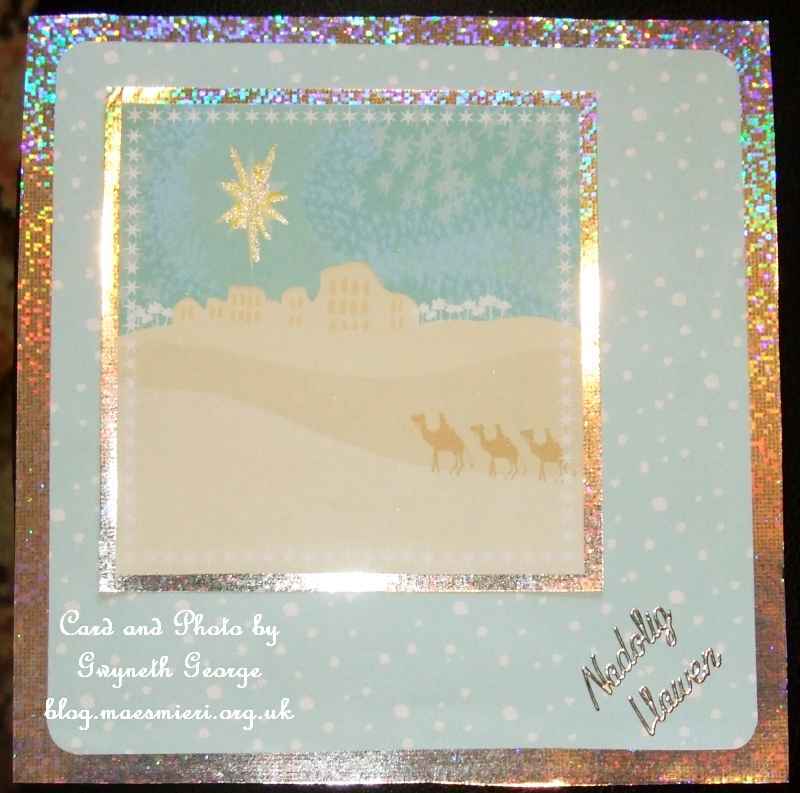 A gold mirror card panel was put behind the aperture in the top mat that the cross is stuck onto for a bit of a different look. 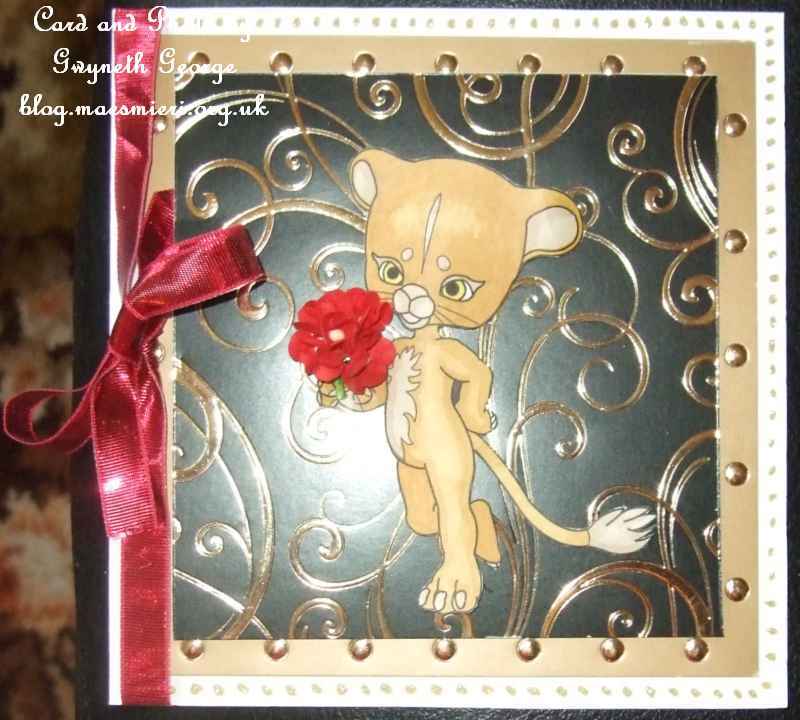 I used a gold glitter pen to write “Yn Meddwl Amdanoch” – which is Welsh for “Thinking About You” – onto the greetings panel. 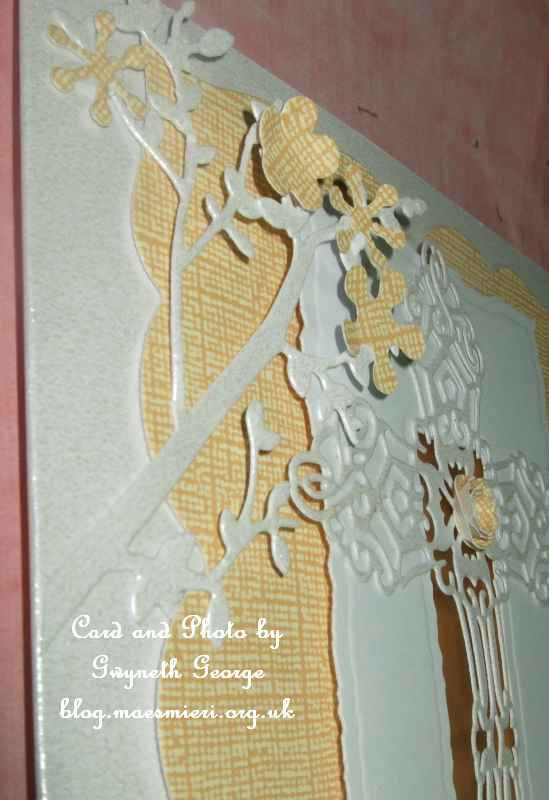 An angled view of some of the details to show the slight dimension. 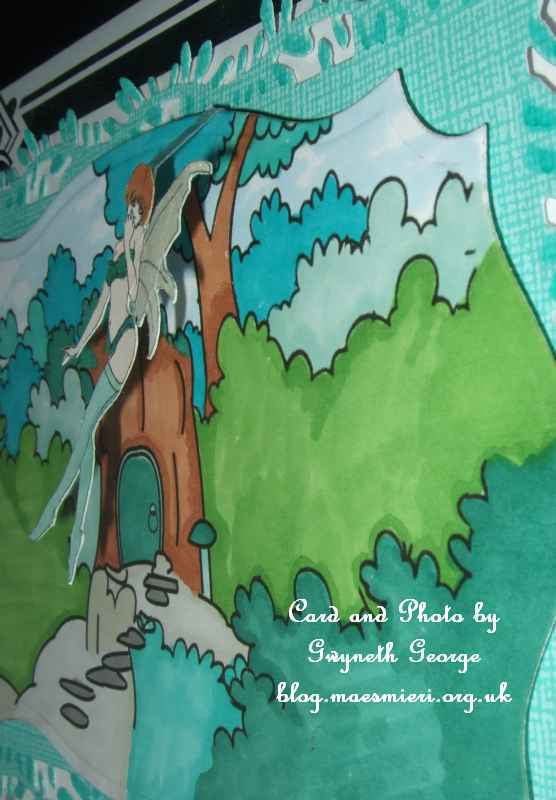 Angled view of the fairy floating above the card background. 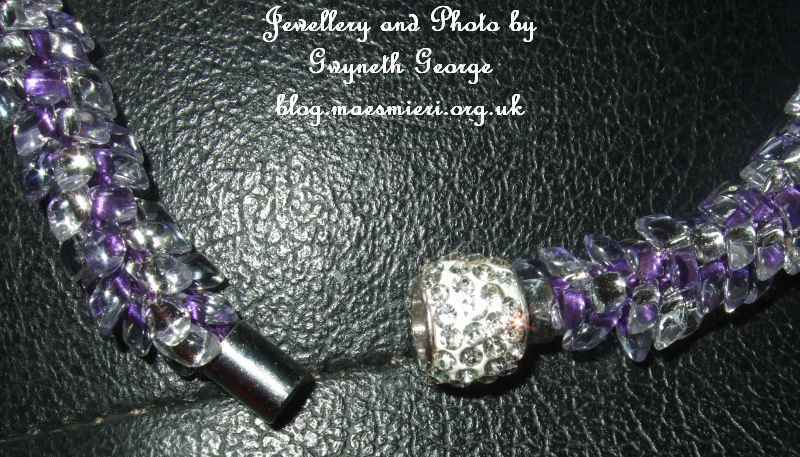 I’ve started making a few more bits of jewellery to give as Christmas gifts and perhaps to sell too. 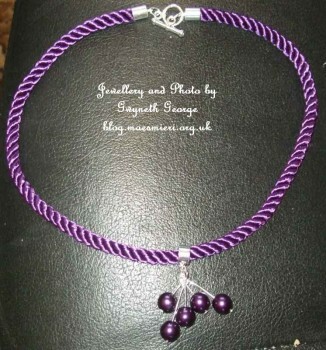 I’ve got a Kumihimo beaded bracelet complete and one half of the front of a Kumihimo beaded necklace finished as well. 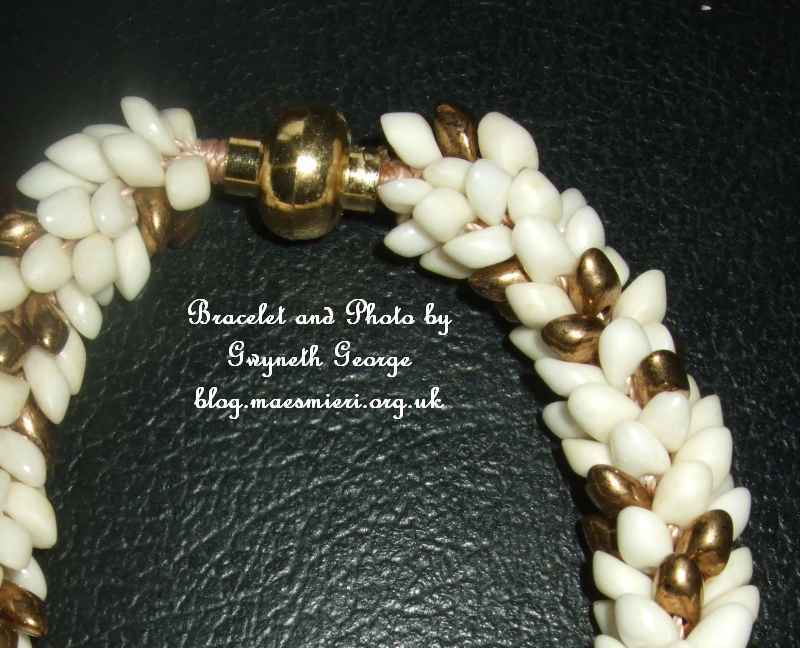 This bracelet is made using three different colours of Long Magatama 4x7mm beads – White Pearl Opaque, Cream Opaque Frosted Lustered and Bronze Opaque Metallic. I used some S-lon thread to make it on and finished by using a 4mm Magnetic Clasp. 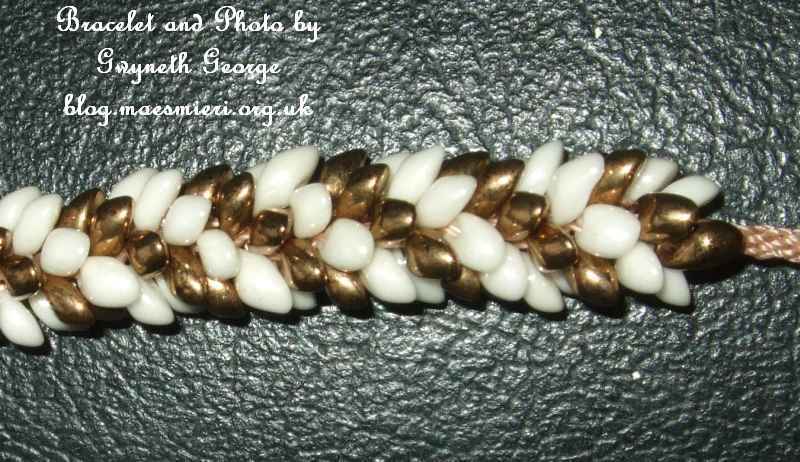 This is going to be half of the front of a necklace made using just two different Long Magatama 4x7mm colours of beads – White Pearl Opaque and Bronze Opaque Metallic. Close-up of the necklace pattern. 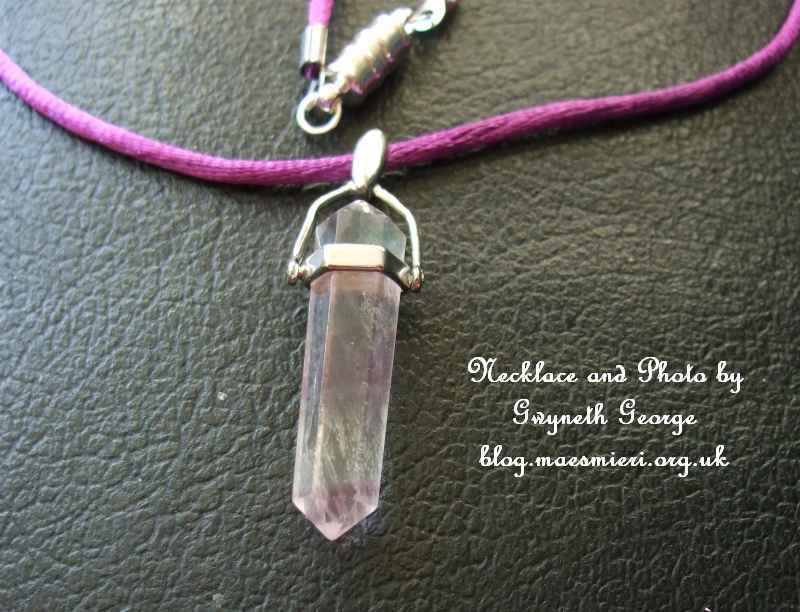 Keep an eye out in my future blog posts to see the finished necklace – assuming I do finish it of course. I had the two youngest nephews over for the 31st (Haloween). We had a bit of a crafting and cooking day. Firstly we cut a circle out of the bottom of a couple of pumkins, scouped out the seeds and then scraped some of the flesh out to make the walls of the pumpkins thinner – one of the nephews wanted some of his pumpkin face just carved (like they carve out letters on the face of gravestones – his instructions – I assume he’s seen something similar on the TV) and wante the pumkin wall thin enough for some light to show through. The pumkin flesh we scraped out went to make a pumpkin soup and a pumpkin pudding for supper. After doing all the pumpkin carving and getting the pumpkin pudding into the oven we watch some Scoobie-Doo episodes I’d recorded and then they coloured in some monster images. 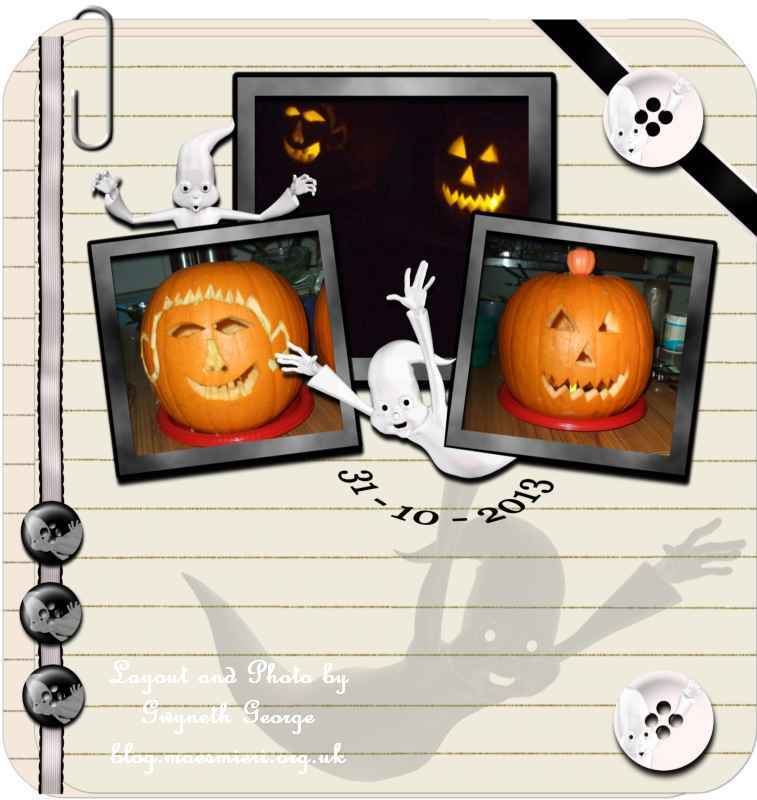 After they’d gone to their grandmother’s place for the night I took the photos of the pumpkins into my computer and made a scrapbook layout with some of them. He’s the layout and some of the photos we took. 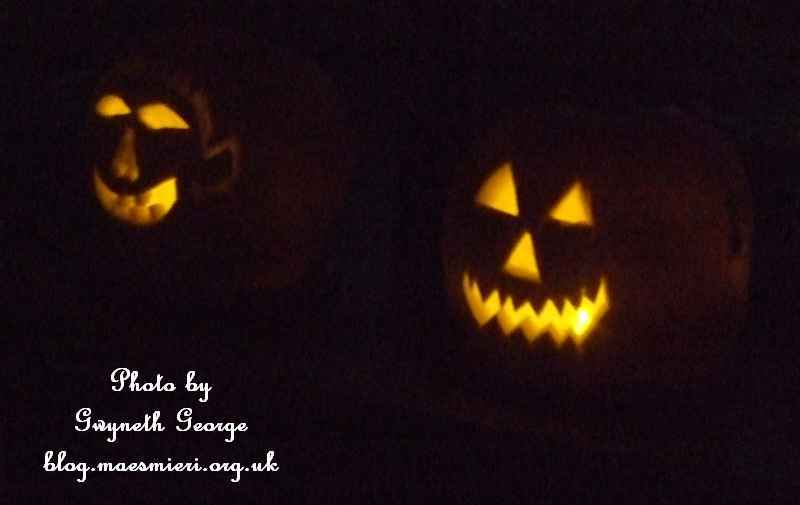 The two carved pumpkins side by side after it went dark here. This design was created by my 7 year old nephew. He marked out the face and did some of the cutting out before getting me to carve out a bit of the detail at the end. 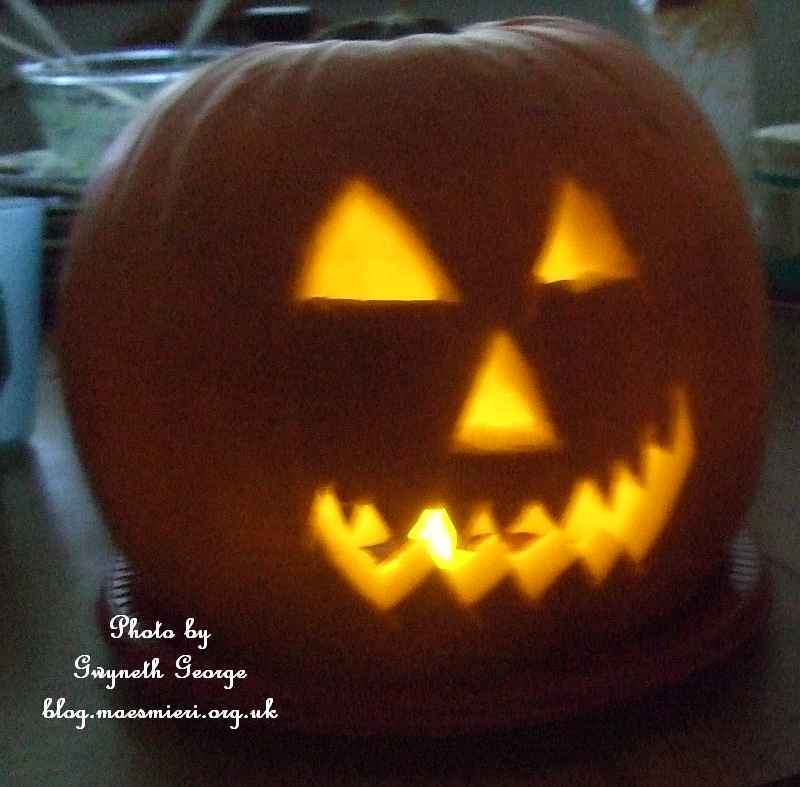 The same pumpkin with a batery opperated tea-light inside as it was getting dark. You can just see the light coming through the cut off areas. This was the design of my 6 year old nephew. He drew what he wanted on some paper to start off with, then changed his mind about practically every element and marked out something different. He got to cut out the eyes and nose but left me to cut out the mouth. 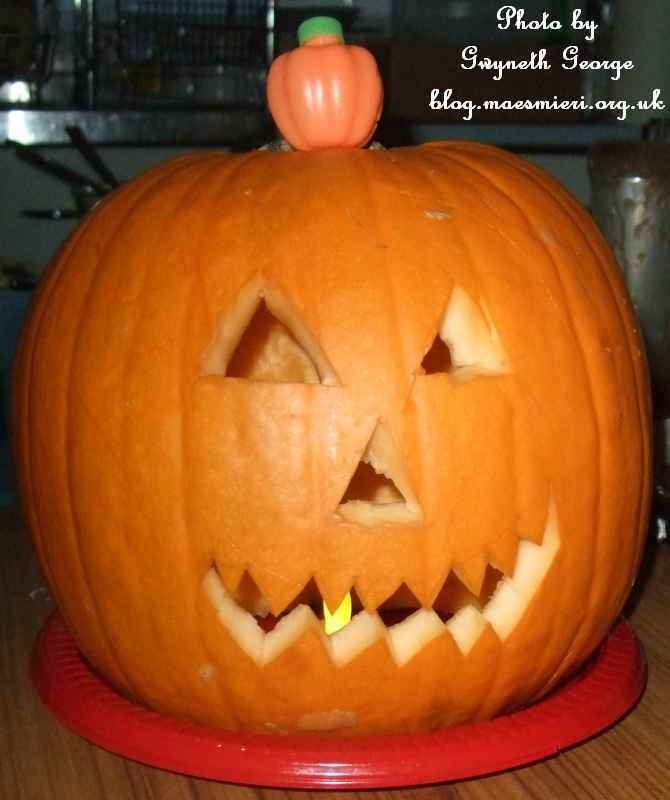 The same pumpkin with a battery operated tea-light inside. Friday, 1st November – Here! 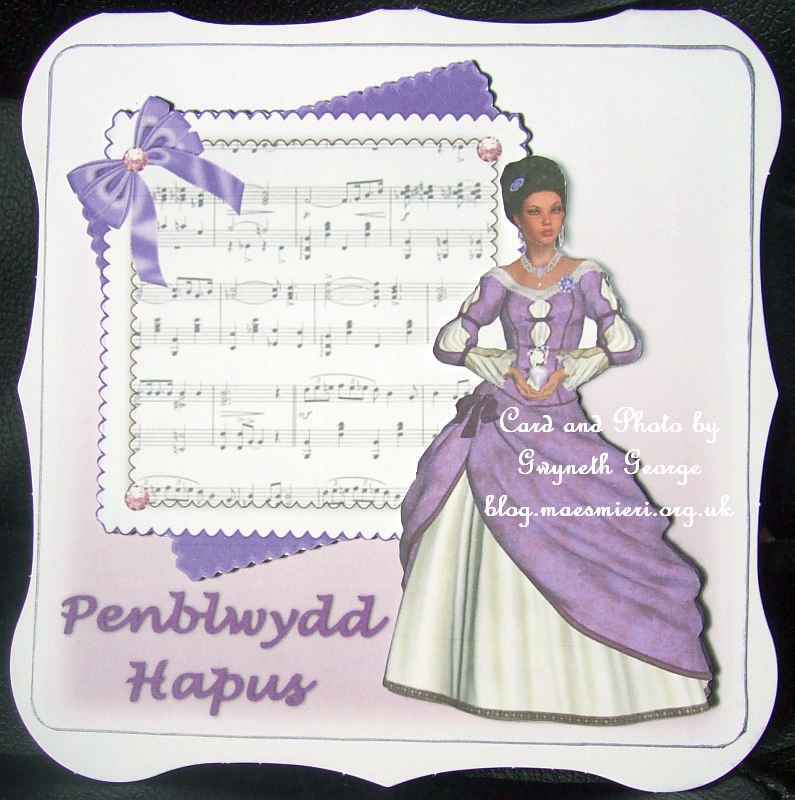 – 99p Crafty Bob Paper, 10 New Froms, FREE CD Volume 70 & Whats Hot This Week!